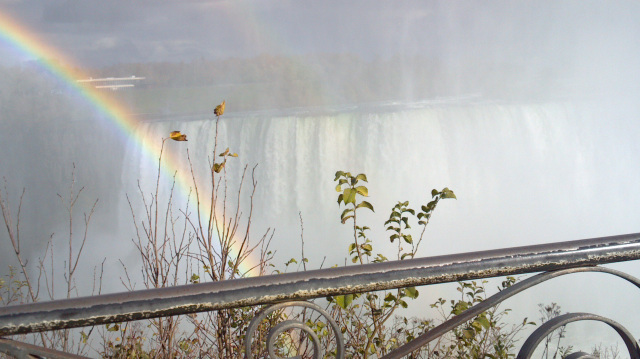 Welcome to Free Wheelers’ 2013 trip from New Orleans, Louisiana to Ontario, Canada. 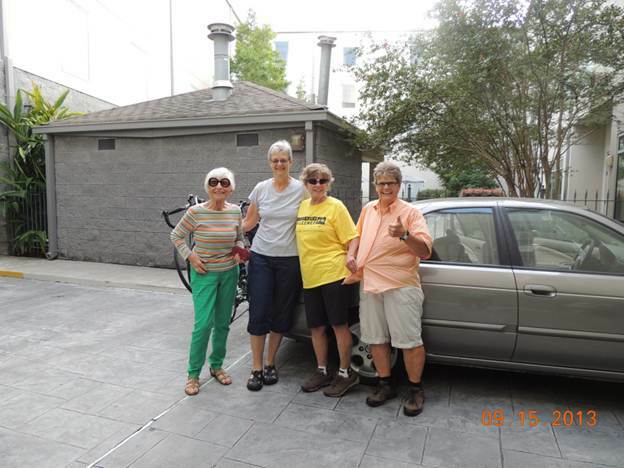 For over a month, Jane, Mary Jane and Ramona biked the runaway slaves’ Underground Railroad network, as Carol drove the supply-and-gear car. Hi to all, especially Jane, Mary Jane and Carol. 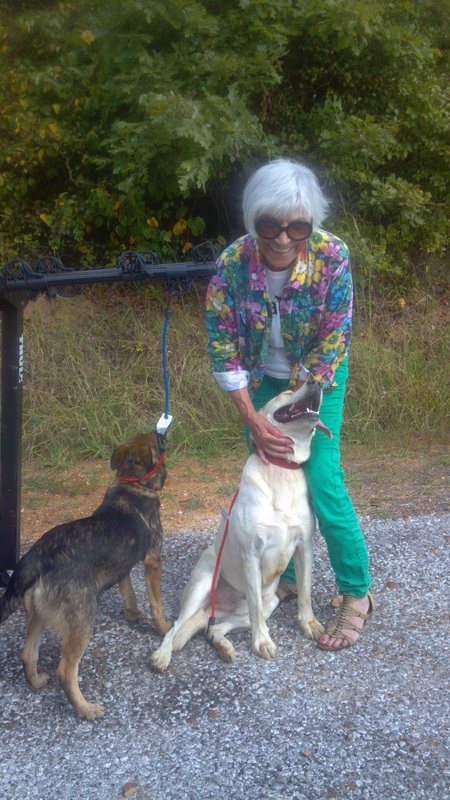 Jane and Mary Jane are on their way to Baltimore and then New Orleans, where we will all meet up. Carol and I will fly into New Orleans on Thursday for the big meet up, some sightseeing and then on Monday start our journey north. Happy travels to all and looking forward to fun times and lots of laughs. 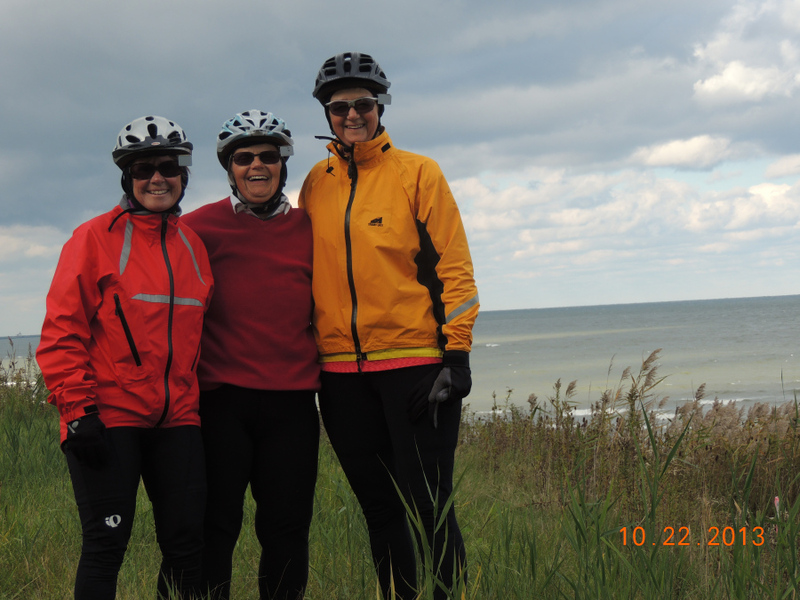 On Saturday, the 7th, Jane and Mary Jane made it to Syracuse, where our bikes were awaiting us. Having been sent by FedEx, the bikes arrived disassembled…soooo, several hours on Sunday were spent putting them back together, plus taking them for trial rides. 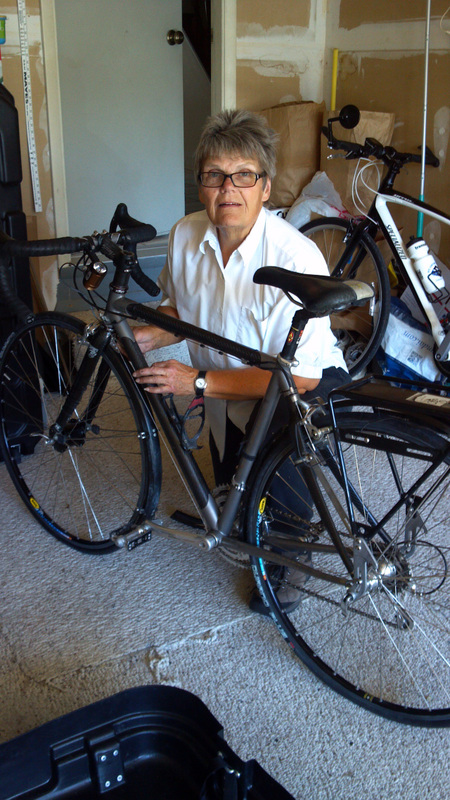 In the picture you see Jane completing the putting together of my bike …. she amazingly knows where each and every of the approximately 25 parts go. I wish I could say I helped, but that would not be truthful. Jane gets all the credit; her looking dazed after such a yeoman’s job is more than fitting. 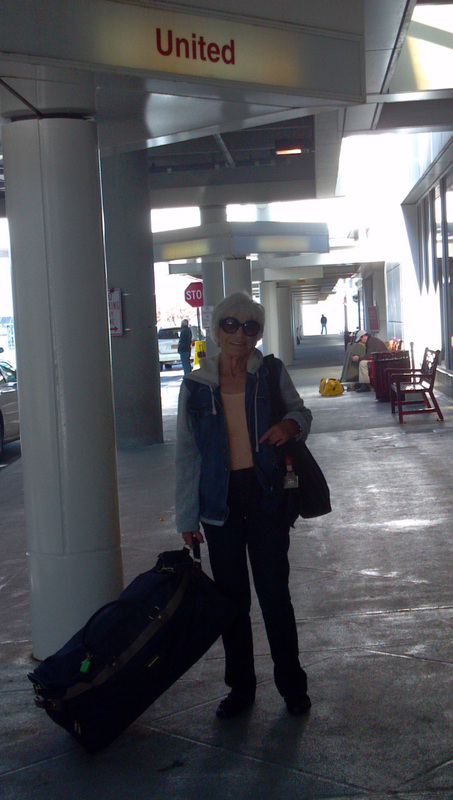 BTW, Jane and I flew into Syracuse in order to pick up my car, which will be our sag wagon for our cycling trek. Carol, while Jane was working on our bikes, I was making sure the car paperwork (insurance cards, registration, etc.,) was in order, plus oil changed, etc. Should be delightful driving … well, kind’a. You did say you were enamored with stick shifting, didn’t you? 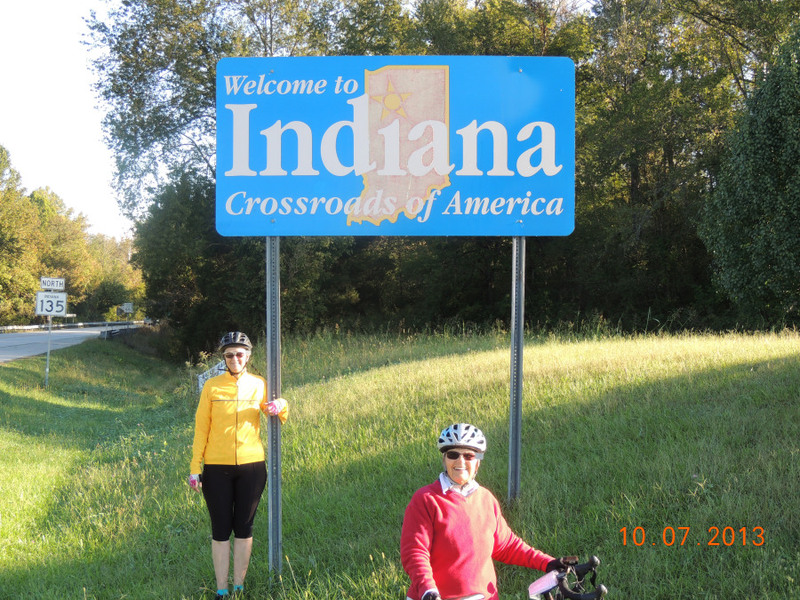 This picture was taken just before we (Jane and I) departed Monday morning, our bikes in tow, for Baltimore, where my younger daughter Anne and her husband Peter reside. 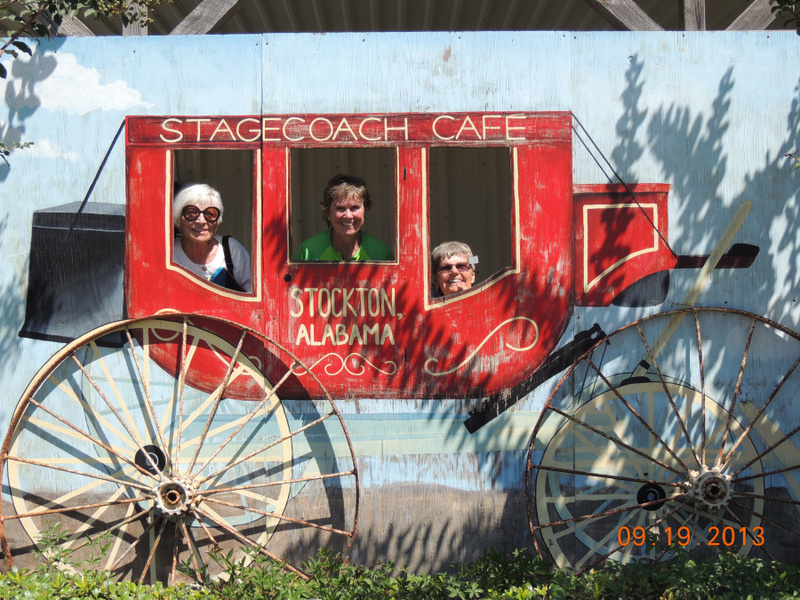 We stayed overnight, enjoying their 16-month-old daughter (and my granddaughter), Evelyn. This is Jane, and I am now in New Orleans. After leaving Mary Jane in Baltimore, I drove through Maryland, Virginia, West Virginia and Tennessee on my first day. Yesterday I drove out of Tennessee, into Alabama, Mississippi and finally Louisiana. Stayed outside of New Orleans last night and did the final 20 mile drive this a.m. What a beautiful country we live in, so enjoyed the drive. I settled into our hotel, did some walking, checked out the neighborhood, found some food, then drove to the New Orleans airport to pick up Carol. Must admit, Carol and I did tour the city for quite some time, trying to find our way back to our motel. Still working on my internal GPS mode. Carol and I went and picked up Ramona, so we are three out of four! For our first night out we went to Mulate’s, a Cajun Restaurant where they played live Zydeco music, quit nice, but we were a bit late so didn’t hear a lot of the live part! Nearly closed down the place, guess that was the case since a policeman escorted us out. Well, one more trip to the airport to pick up Mary Jane, three more days to tour our surrounds, then bring on the BIKES! 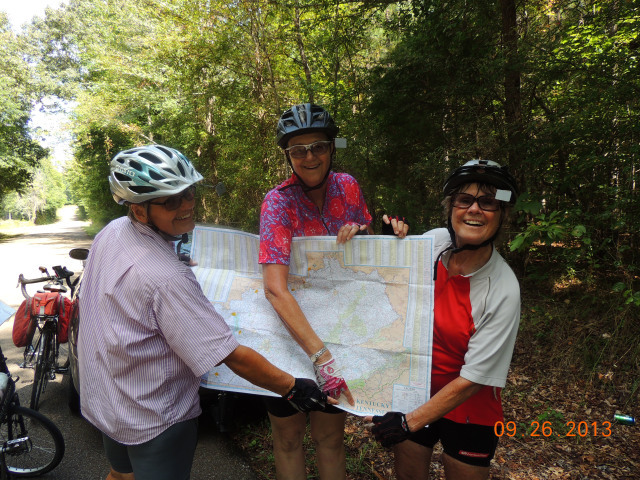 As of today, Monday, September 16, we have completed our first official day of riding, making our way from Dauphin Island (where we spent the night, enjoying a wonderful room in a motel on the beach) to Gulf Shores, Alabama, where I (Mary Jane) am writing this. 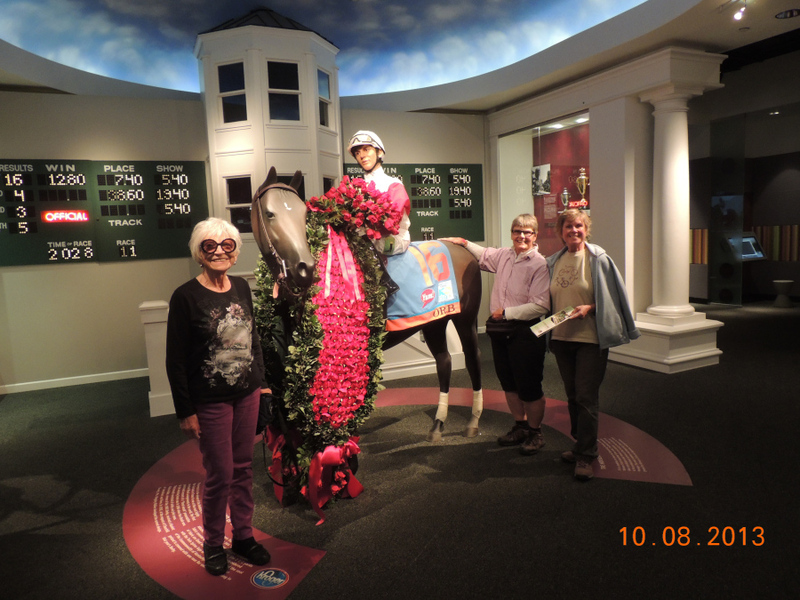 Before filling you in on our actual riding adventures of today, we wanted to “tie some loose ends together” regarding our stay In New Orleans. I arrived in New Orleans early Friday evening, just in time for us to think about dinner. 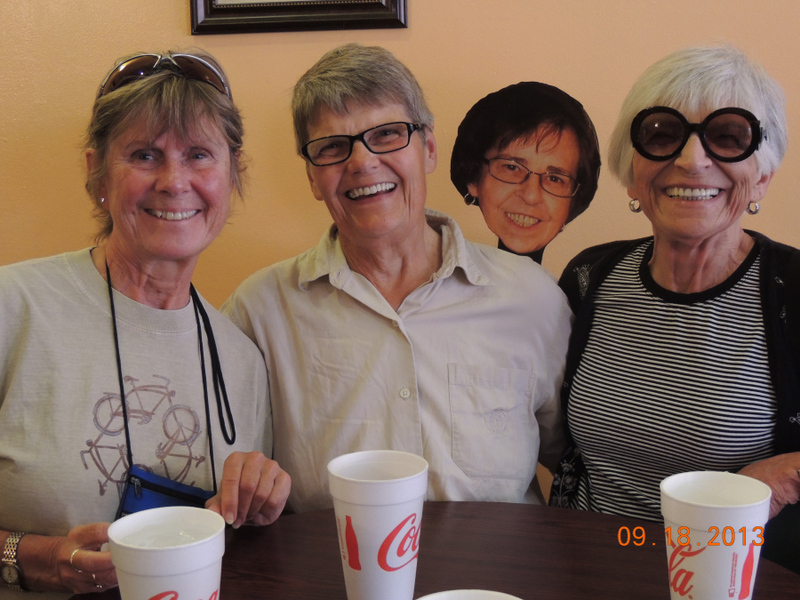 Jane, Carol and Ramona had been enjoying the food prior to my arriving, assuring me that it was likely difficult to find a bad meal in the area. We checked at the front desk of our hotel and were advised that the Herb Saint Restaurant, within walking distance, served wonderful food. Off we went, and agreed that the elegant presentations of what each of us had chosen, in addition to the wonderful flavors in each of our entrees, contributed yet again to their impressions about the delicious food available. I should add that though the portions were modest, we in no way felt slighted in terms of calories! Saturday was a full day. We rode the Saint Charles street car ($3 for an all day pass, no restrictions, good until 4 a. m. Sunday morning!!) hitting first Tulane University briefly, then enjoying a stroll at the Audubon Park, close to the University. 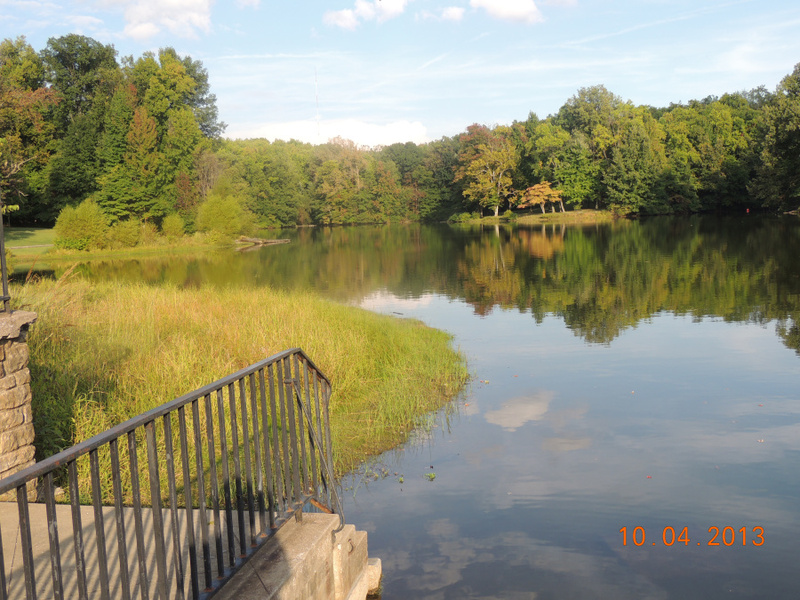 The Park includes a lovely lake (about two miles in circumference) with a wonderful walking/biking path all around. We walked clear around enjoying the lovely birds . . . some which we could identify and others which we couldn’t. 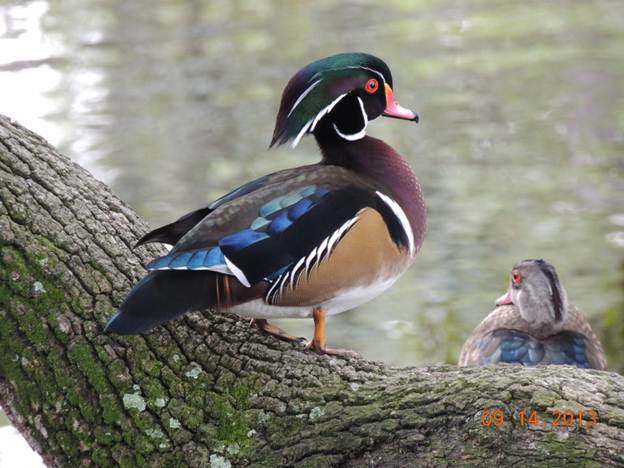 A Wood Duck is in the photo above . . . anyone know how a bird of such vibrant colors got that name?! The beauty of the landscaping with all its greenery, as well as the wildlife observed, went a long way in taking our minds off the sweltering heat and dripping humidity. We looked for lunch, confident that we would indeed find good food. We were not disappointed . . . we found a restaurant called “La Roux” (not sure how that translates!). Actually we thought it was not open . . . that staff seemed to be cleaning up from some event of a few hours prior. The manager saw us looking, assured us that he would be happy to see that we were fed, ushered us to a table, presenting us with menus. We could not believe his cordial and gracious hospitality! He wanted to know where we were from, what brought us to New Orleans, etc. And again, we were not disappointed in the food. It was a “comfort food” kind of place . . . I had baked chicken, (two huge legs) though most things were deep fried. Macaroni and cheese, sweet potato fries, kale . . . were a few of things we thoroughly enjoyed. We noted that we were addressed as “Mam” . . . seems to be the southern way; we’re noticing the same custom (addressing customers or others not known to the speaker in the respectful way) even as we venture into other southern states. 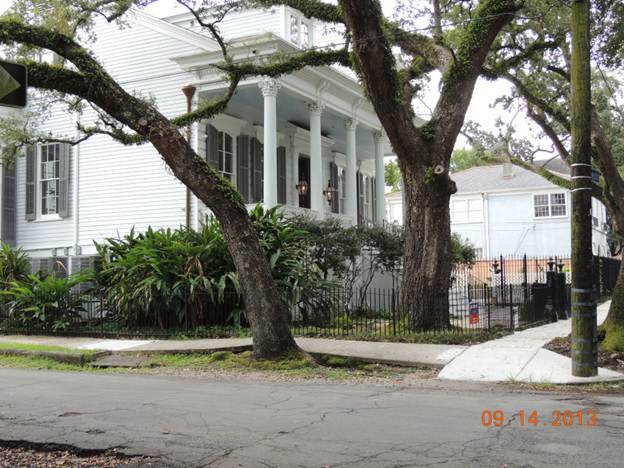 We further explored the Garden District (where La Roux is also located), enjoying the interesting houses . . . all well established, large, and well maintained. By this time, clouds were beginning to form and we became a bit nervous about being caught in the rain. 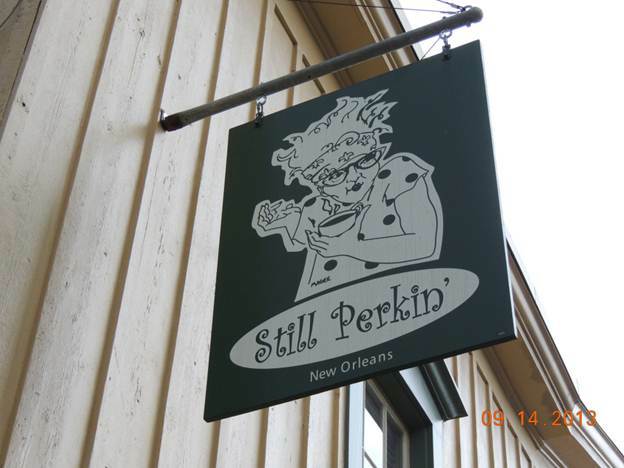 We were more than lucky to stumble upon a lovely café called “Still Perkin’” . . . how cute a name for a coffee shop is that? A further stroke of luck: it began to pour as we were enjoying our coffee! Luckily the downpour did not last forever and we were able to leave when there were only some continuing sprinkles. A major agenda item of Saturday was laundry . 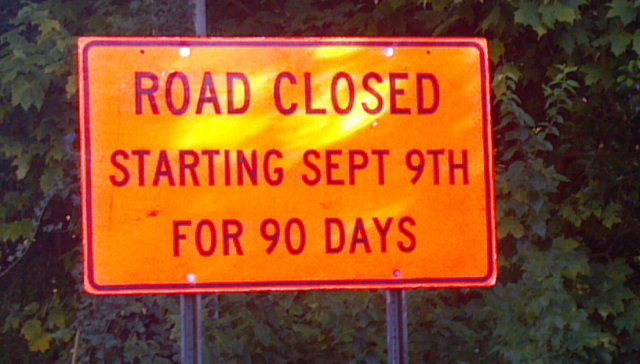 . . always a challenge on our biking trips. Just finding a conveniently located Laundromat is the first challenge, then after finding one, the hope is that it is clean, and that the machines actually work! We found a wonderful one! And another clever name: “Suds ‘dem Duds”! 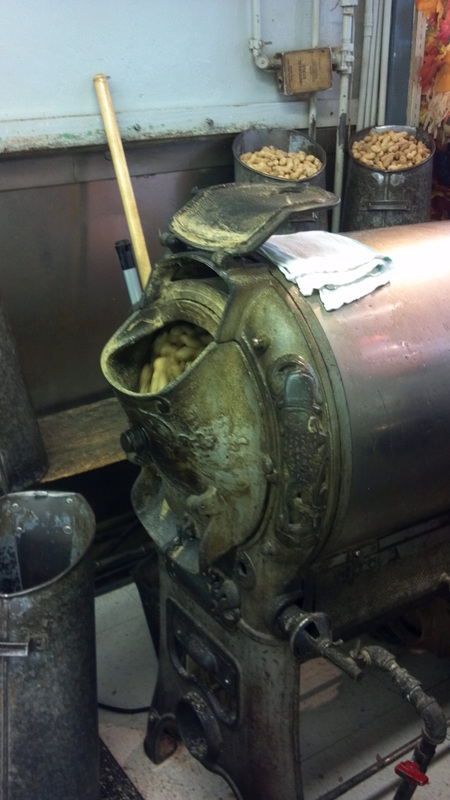 Not only was it well cared for, it was air conditioned (unheard of for a laundry mat, in my experience!). As well, the proprietor offered free laundry detergent (again, unheard of . . . most Laundromats make money on the detergent sold). We noted the artful walls including interesting objects hanging on them, for example, a scrubbing board! Efficient machines, too . . . we were done in a little over an hour! Still full from the “lunch” at LaRoux we decided to forgo dinner, but to enjoy a snack instead. 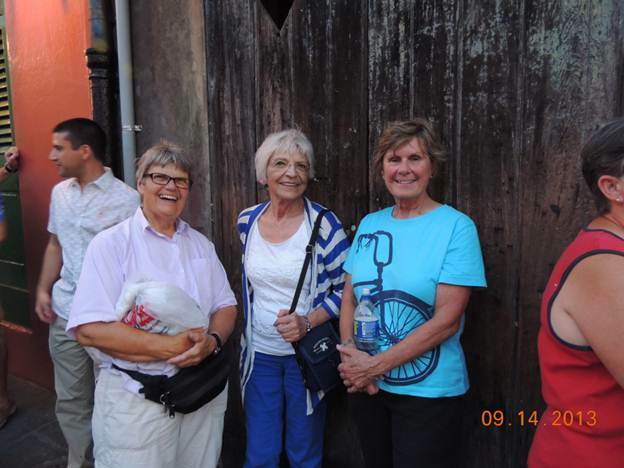 Carol, Jane and Ramona had all enjoyed, even raved about, a pastry for which New Orleans is known: the Beignet; they had tried them the day before. 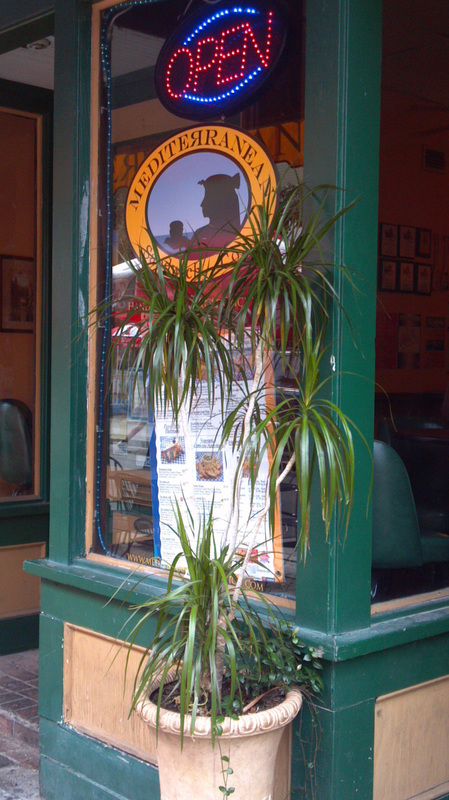 We passed Cafe DuMonde specializing in teas, coffees, and Beignets . . . we had to stop. The pastry was way too enjoyable. What was there not to enjoy about deep fried dough, served hot, and dipped in confection sugar. Soooo good, and a terrible calorie count, but I couldn’t help but enjoy every crumb! Following this we were on a mission to locate another edible delight for which New Orleans is noted: Mufuletta Olive Salad . . . we did locate a jar. (Trying it later, we all agreed that it was delicious and have been enjoying it on turkey sandwiches.) I must add that part of the adventure in locating the M. O. 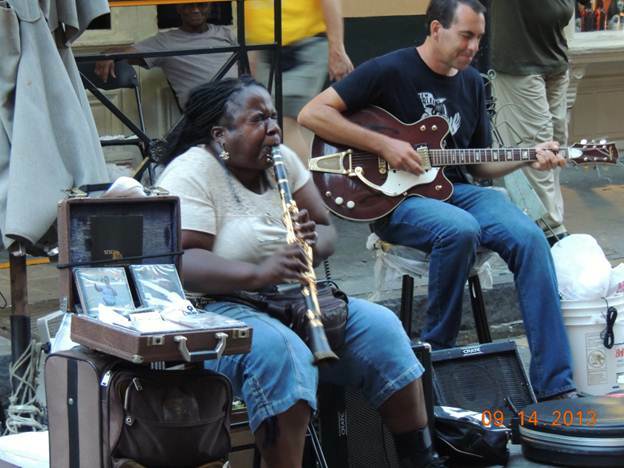 Salad was enjoying the amazing street talent along the way on Bourbon Street. One clarinetist, in particular (see picture), stood out, playing with such heart and soul that one could not help but stand and gawk while enjoying every note she played. Her fingers seemed to fly and the notes seemed to come out so easily in spite of the sweltering heat of the day. There were many such acts. As well, the partying in the streets could not help but be noticed. Is there any other city that says “Party Time” with it music inside and out of its buildings like New Orleans? 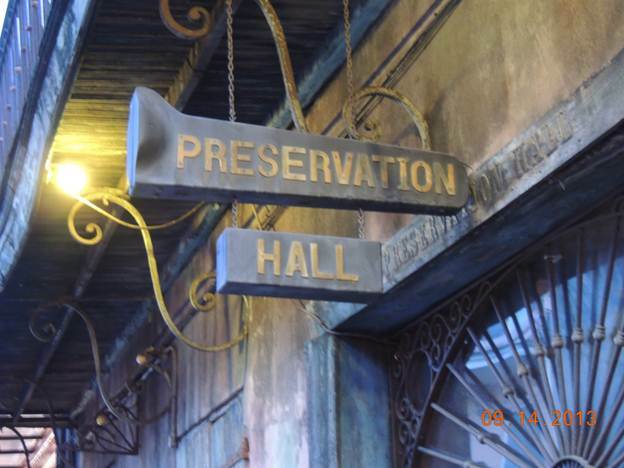 The biggest treat of the day, perhaps, was attending a concert in Preservation Hall. An ensemble of seven musicians playing the piano, trumpet, bass violin, banjo, drums and clarinet, kept us entranced for an hour with their amazing playing of tunes, most of which included each musician taking a turn improvising, with the others supporting in the background. There was room only for about 75 people in the crowded, non-airconditioned room. We were advised that we would have to wait in line for quite a while (we waited for an hour and 15 minutes) to get tickets, but that even with the several negatives, the concert would be worth it. “They” were right! BTW, by the end of the day we had clocked a little over seven miles in walking that we had done! A busy day, for sure. Sunday, was “the Day of Reckoning” regarding the car . . . would we really be able to get four adults and all of their luggage packed into my Nissan Sentra! 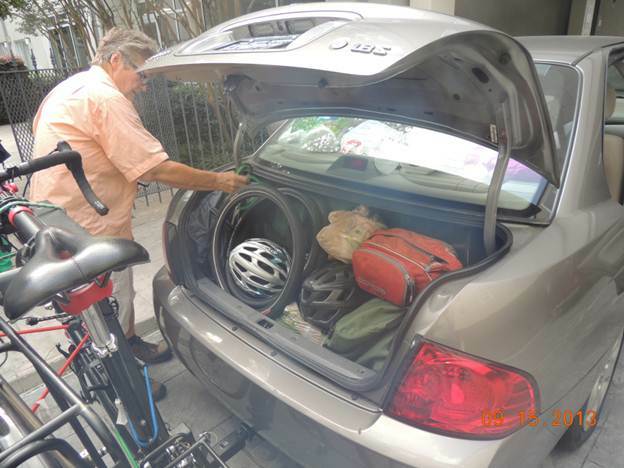 As well, we had a cooler and various other “things”, like paper towels, bicycle gear, and of course, our coffee maker . . . we’ve learned that that is a MUST . . . those tiny pots and the anemic coffee they make found in motel rooms simply don’t work for getting going in the morning! 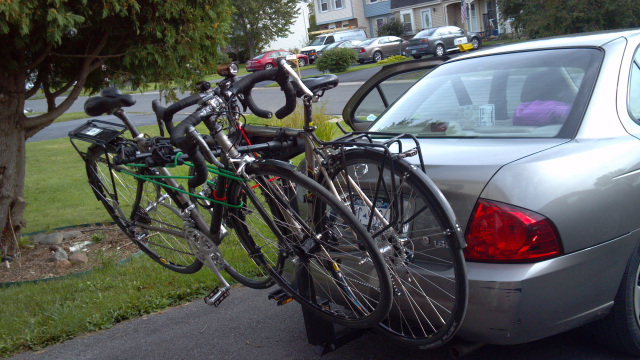 Then, there were the three bikes to get arranged on the bike rack on the back of the car. Getting all loaded up with nothing hanging out was a challenge to be sure. We did it, and even left New Orleans without anything hanging out! Before leaving, however, we had to take in the New Orleans Museum of Art . . . the Park of Sculptures part. 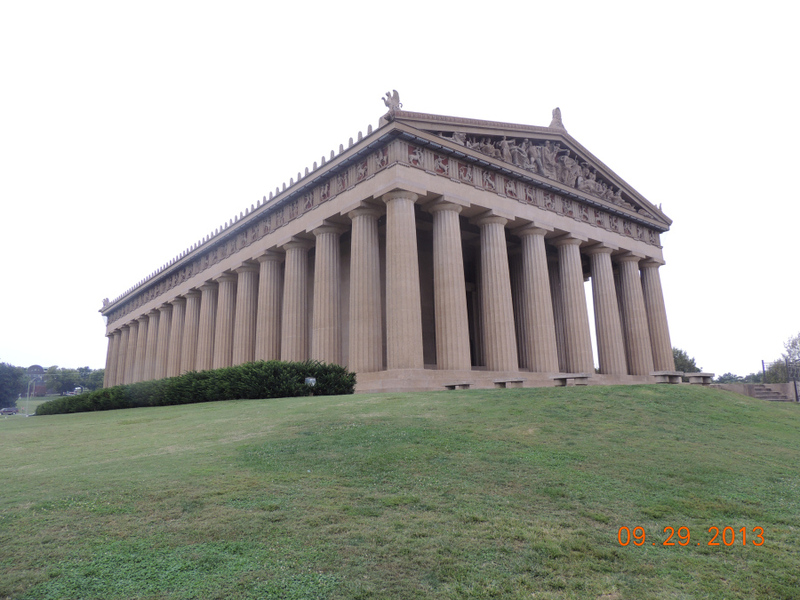 Another walking tour . 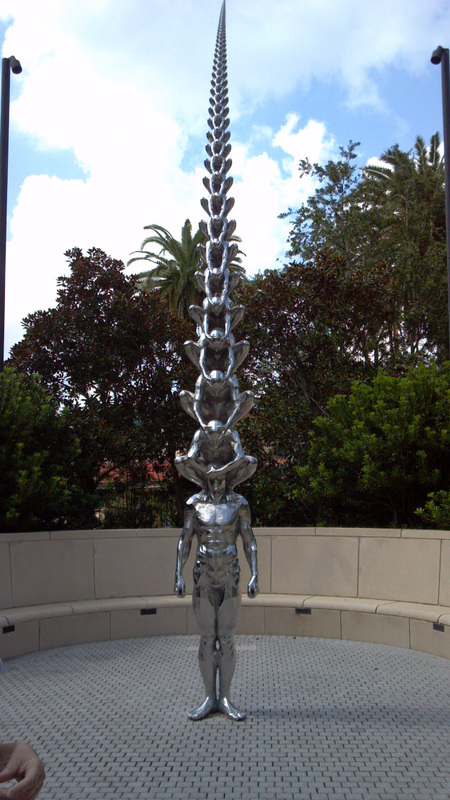 . . a beautifully landscaped Park with 65 sculptures to view . . . and for free at that. Again, 90+ degree weather, and humid, but it was well worth it. 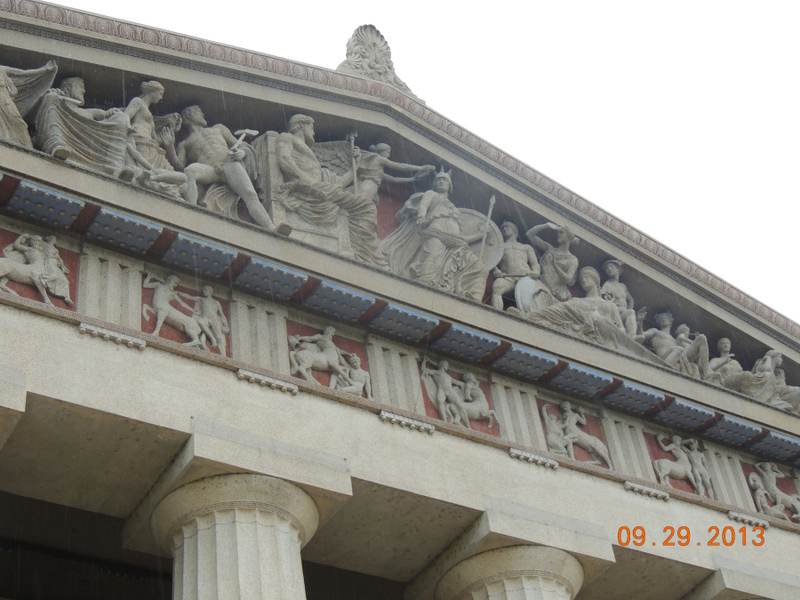 We also took in the Metairie Cemetery, the largest cemetery in New Orleans, displaying an array of tomb architecture. The tombs are beautifully maintained and quite a contrast to the very old and run down cemetery we had walked through yesterday, the Lafayette Cemetery. We were a little sad to leave New Orleans . . . in some ways it felt like a continual party, but we were ready for a little quiet! We crossed the Lake Pontchatrain Causeway (24 miles long!) 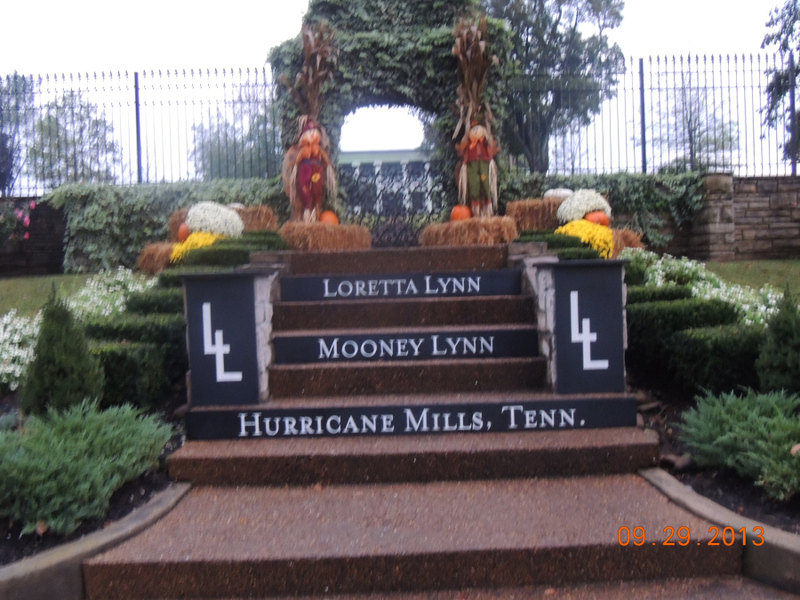 as we made our way to Bayou La Batre, Al. More specifically, we found the wonderful motel on Dauphin Island . . . close enough! We enjoyed another amazing sunset . 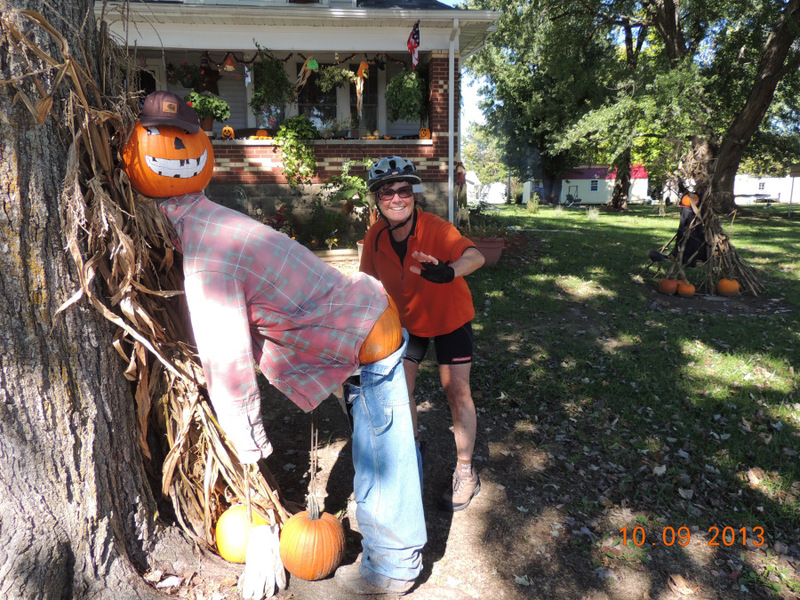 . . we were ready to start our actual riding the next day, Monday! 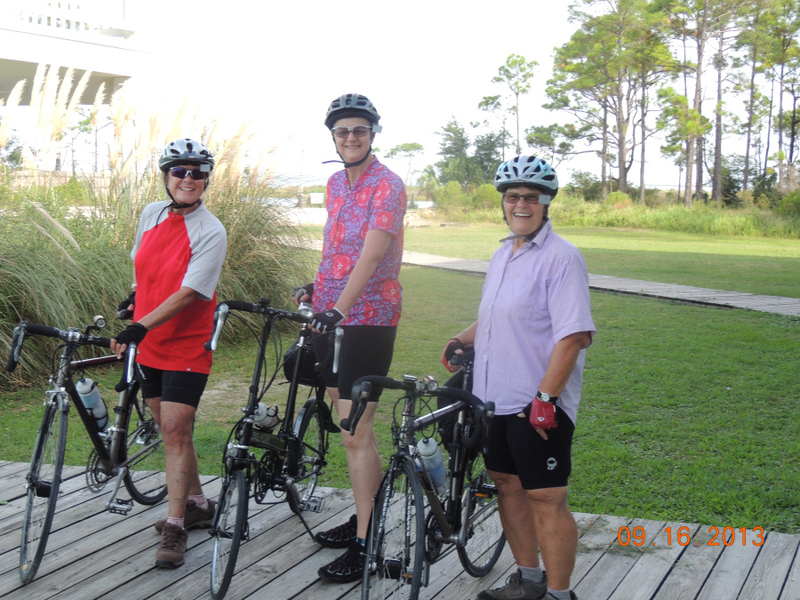 DAY ONE of the ride began this morning in Dauphin Island, Alabama. Without going into specifics, it was very hot and humid. 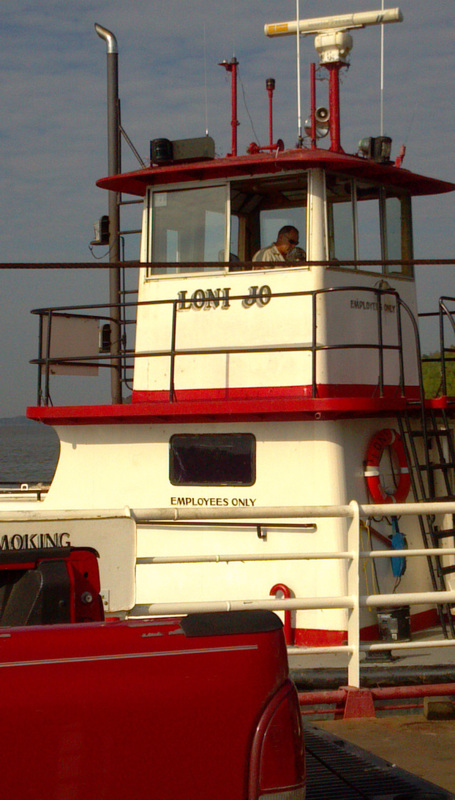 Had a lovely 45 minute ferry ride to Fort Morgan. Noticed many oil rigs off the coast, and strangely, the ones we came close to, didn’t appear to have any human activity. The ride today was short, and from the car driver’s perspective, quiet and easy (few cars and even fewer hills) in spite of the heat. I am feeling very much the newbie with my veteran bike friends, and they are being kind and patient, as I learn their routine. Having ice and cold water is essential, as well as a good place for lunch, which worked out nicely, when we happened upon The Sassy Bass. 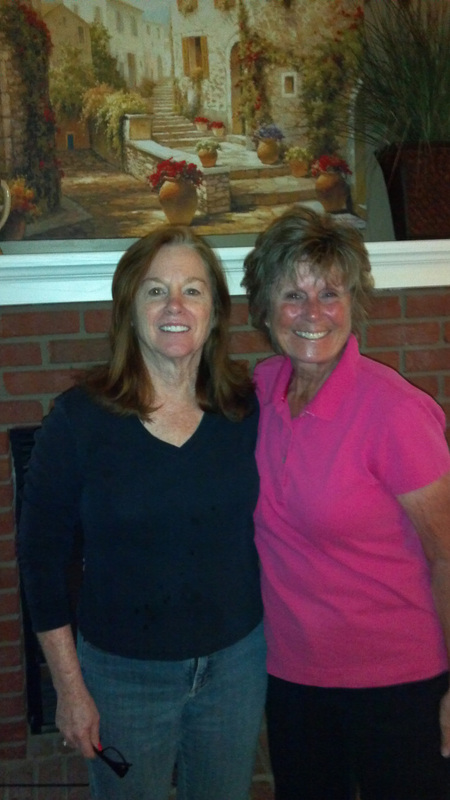 Destination was Gulf Shores, Alabama, where we checked in for the night. 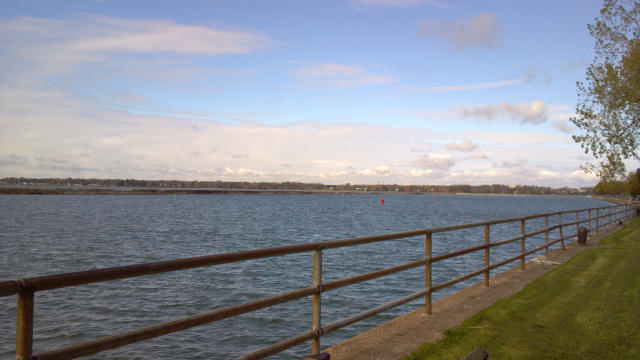 After unpacking the car, Jane took off again on her bike to explore and get more miles. While we showered at the motel, the sky turned dark, and a brief cloudburst gave Jane a shower as well. 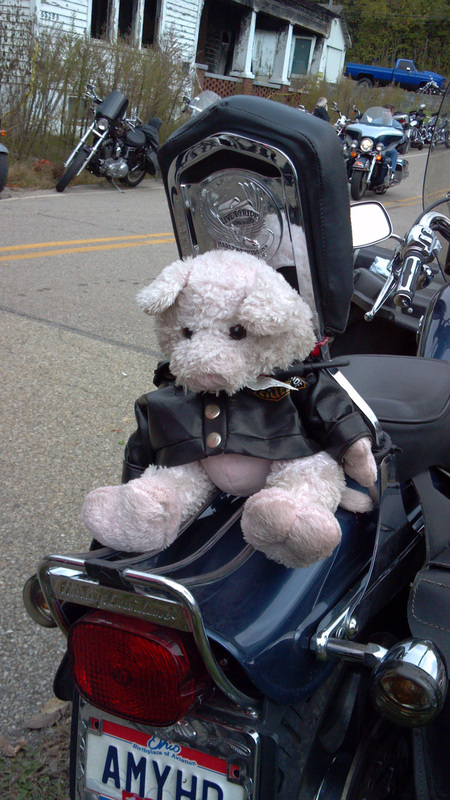 We’re turning in early… the ride was short today, but the heat made it exhausting. Looking forward to tomorrow. First Day of Riding. All Smiles! This part of Alabama seems like “vacationland” with all the water and beach houses on stilts and no greenery. 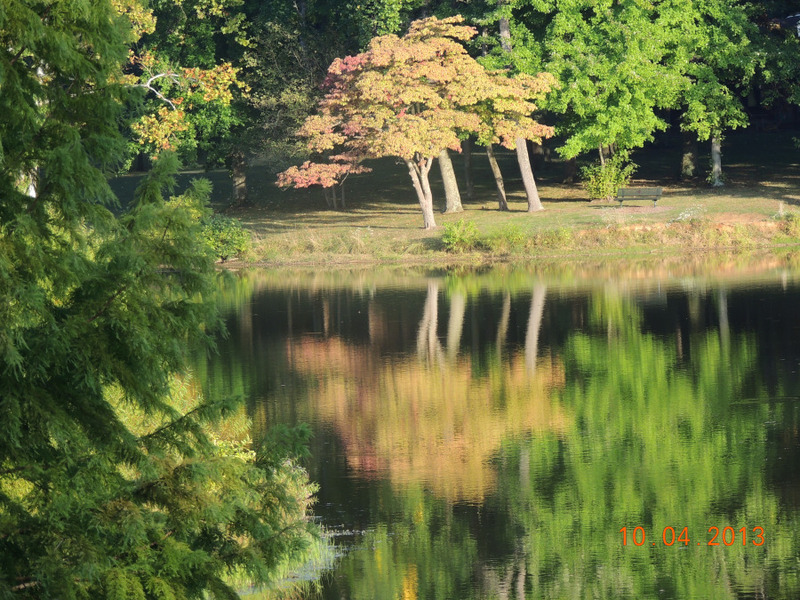 As we traveled northward along Mobile Bay, the properties started looking more “year-round” with lots of foliage and mature trees. As we went along, the homes became estates, one more beautiful and lavish than the next, and the names on the gates were clever and amusing. 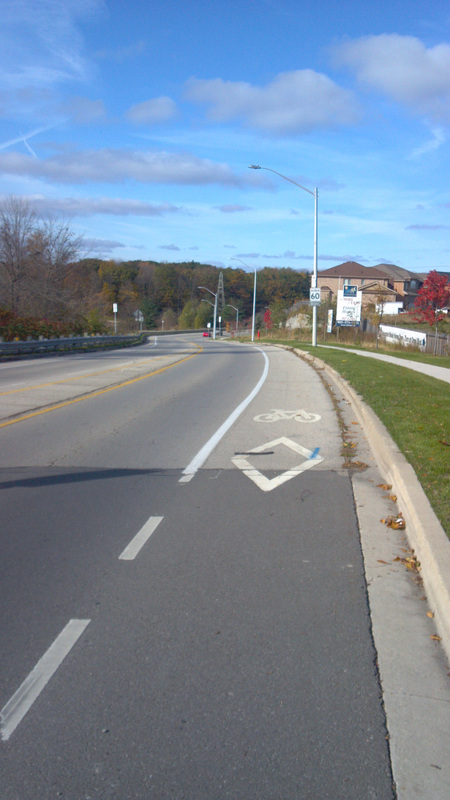 There were very few cars on the road, plus a nice sidewalk/bike path. The road-kill is amazing . 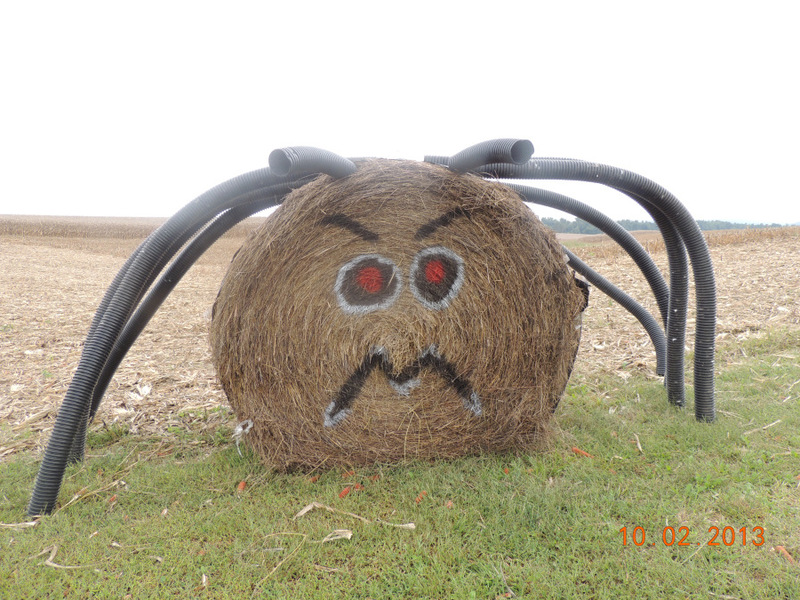 . . we must have ridden past six good sized armadillos and possums that had been hit . . . and the tail wind kept the reminder alive that we had passed a dead animal! The front of the car is full of the love bugs that get squashed as we drive…love bugs are insects that connect and fly together. Forgot to mention all the cicadas we heard in New Orleans, which are apparently absent since we got into Alabama. The lovely corridor of upscale abodes bore no fast food outlets nor places to easily refuel, but we came to a sweet little deli with everything homemade…emphasis on the desserts. Mary Jane was particularly fond of some oatmeal cookies with a layer of peanut butter on top, covered with a rich chocolate topping. Right after lunch as we got on our bikes we encountered some clouds and sprinkles. But the real downpour occurred a few minutes before we arrived in Daphne when we got truly soaked! We were glad to arrive at our dry motel room where we could enjoy a more preferable shower! Spending the next two nights in Daphne…a short distance from Mobile (Mo BEEL as they say here). First order of business today was the bike shop. Jane and Mary Jane needed some adjustments so after dropping the bikes off, we went to the adjoining mall that had a Super Cuts and a nail salon. An hour later, Jane and Mary Jane had new coifs, and Carol had a manicure. Mobile is recognized for celebrating the first known Mardi Gras in America in 1703. Every year they have two and a half weeks of pageantry, with costumes, floats and marching bands. 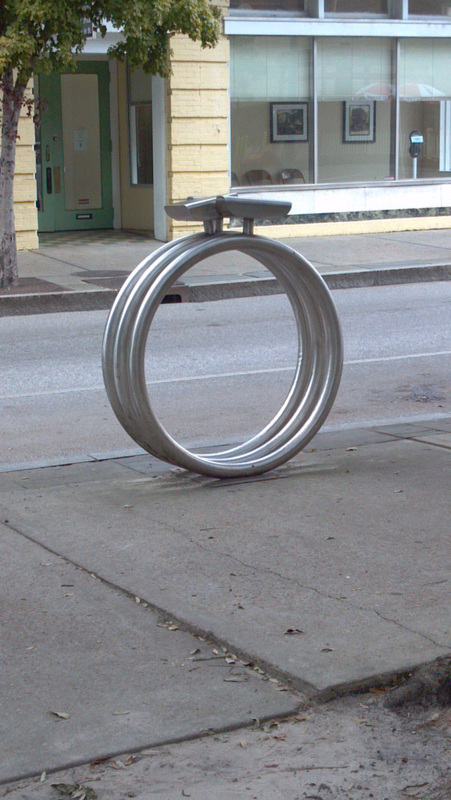 There is a public art treasure hunt throughout downtown Mobile to raise awareness of how important oysters are to the economy. Giant fiberglass oysters are sponsored by local businesses and organizations, painted by local artists and placed in various locations. We enjoyed walking the streets (so to speak) noting the beautifully cared for gardens and flower gardens lining different parts of different streets. The temps were in the high 80′s, sunny, and humid. 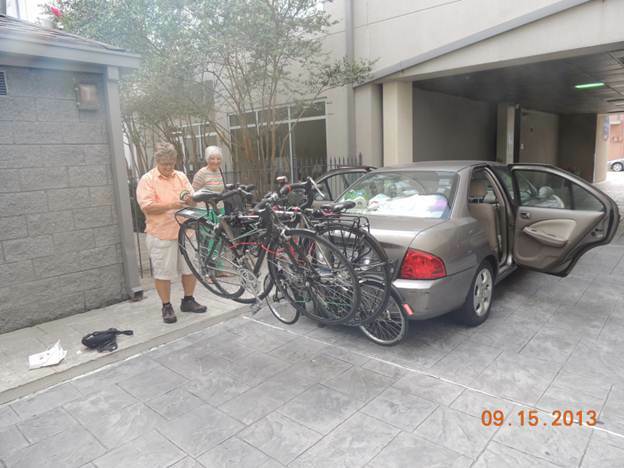 Upon retrieving our bikes, we were impressed with the workmanship of the bicycle repairman, noting that he had indeed taking care of the issues with our bikes . . . charging us only $17! Mary Jane had been wanting a phone holder for her cell phone. 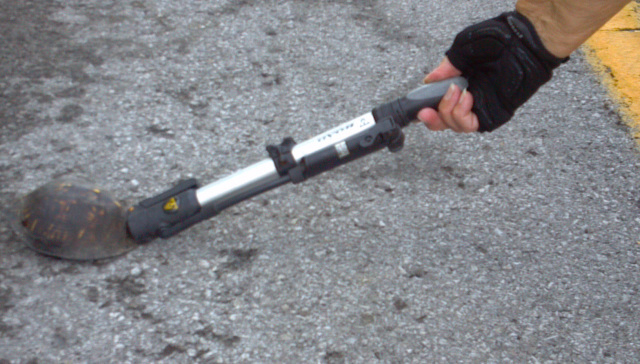 She purchased one at the bike shop and had it mounted for free. 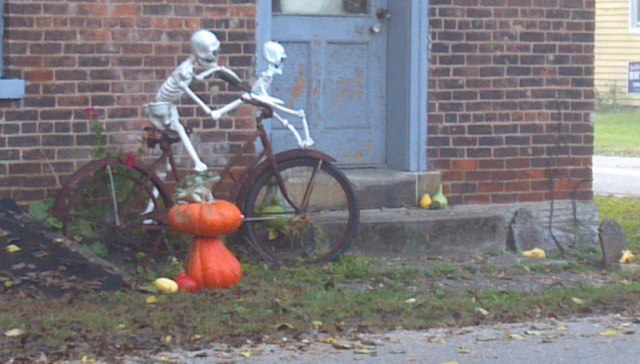 Again, the bike shop turned out to be a bargain. 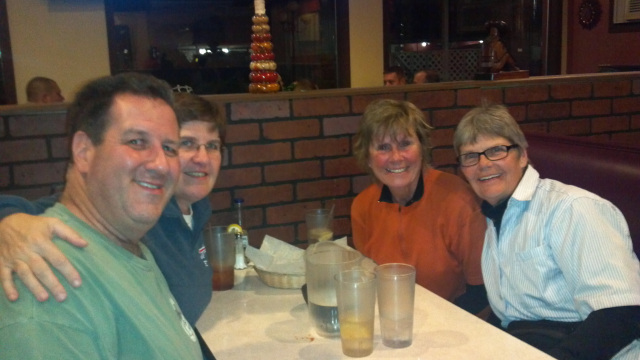 That evening we met Adam (brother of one of Mary Jane’s sons in law, Peter) and his wife Becca, for dinner. They were such a treat to be with, each exuding so much positive energy. Adam knew of a place in Dapne called Manci’s . . . actually quite a special place having been featured on the Food Network. (See photo) Not only was the food an amazing adventure with entrees including unique hamburgers, such as the Hurricane Hamburger, but the decor was also an experience we all enjoyed. Manci’s features funky antiques covering the walls making it seemingly impossible to fit even another tiny artifact anywhere. We have been in Alabama for a week, and are finding that towns with services are few and far between. Some of the days are quite long (93 miles, 72 miles, and 81 miles were the last three) because there are no accommodations in between. Furthermore, once we get a place to stay, the internet has been nonexistent or too weak to transmit. Hopefully we’ll be able to catch up in the bigger bergs. Still in use in Mobile! 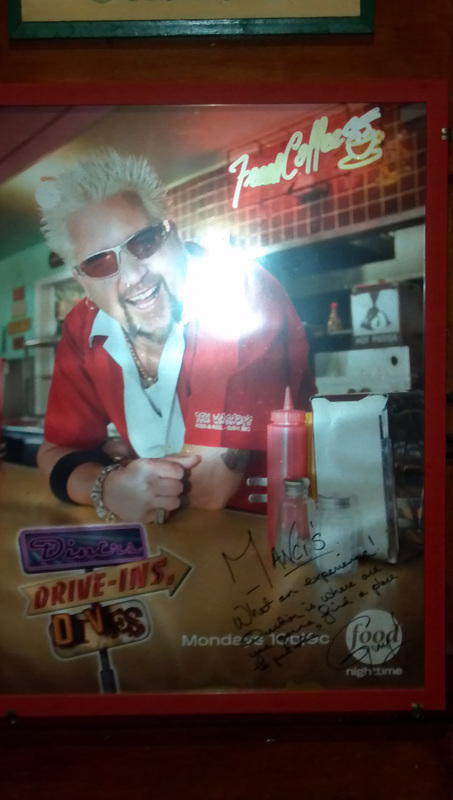 Commemorating Manci’s having been featured on the Food Network. We’ve now been riding for 6 days. 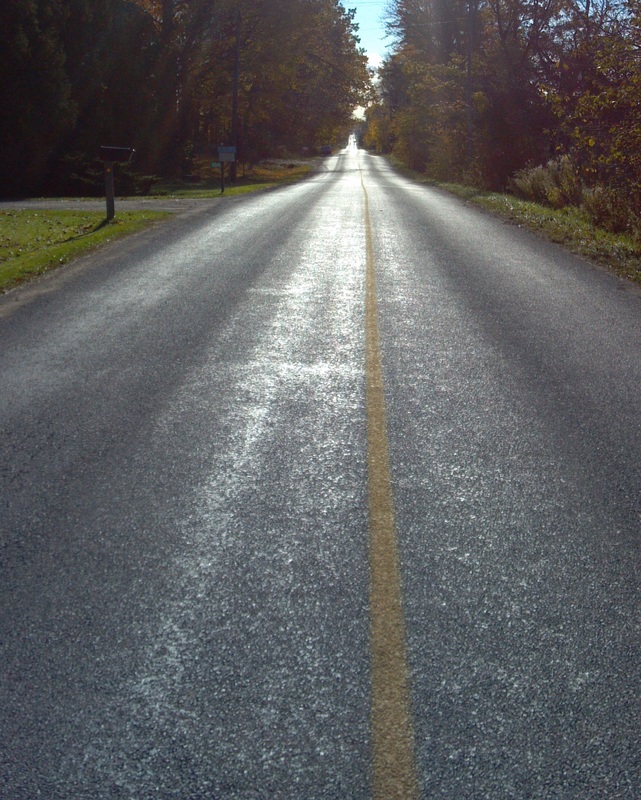 For me the Road is the most important piece of the ride. It determines your comfort, effort, ease, scenery, fear, joy, dread, exhaustion, places to eat, sleep, and oh so much more as you will read. It is what we are closest to, for sometimes eight hours or more a day. The roads we take are determined by Ramona. She uses bike, road, computer and any other kinds of information and any maps she can get her hands on, as to what’s safe, scenic, and gets us where we need to end up. It’s a job that takes her months to figure out, then she prints up the directions for each day. These are called daily route guides, and without them, we would be lost for most of each day. So, here’s how it goes, we check our DRG, first direction from hotel. The first number tells you what you have for miles, the second how far to ride. …and we’re off. The conditions of the road is the first eye opener. Does it have a shoulder, how’s the traffic and it’s speed, of traffic, how careful are drivers toward bikes, is the road cement, chip seal, smooth, under construction, in bad need of repair, lined, rutted, or the latest; those buggers, rumble strips. All, determine if you’re going to have a lot of time to gawk around, looking at all that you are riding in, or if you’ll be watching behind you for cars, pot holes, ruts, or trying to stay off the rumble strips that are often in the middle or front edge of the shoulder. As you know, this can change on every turn. The views, through the valleys, hills, towns, farm lands. My favorite, a town. So much to see, houses, shops, people, children playing, people waving. An occasional car will come up beside, down goes their window, “Where you going, why, how far?” Always, “Be careful!,” ends our conversation. The sky changes from clear to cloudy, overcast, hopefully, if there is thunder, it is in the distance, the sun continues its course across the sky, and before you know it, it is setting, making spectacular art across the sky. 57.0 1.5 US Alt 45, Motels LEFT on US 45. 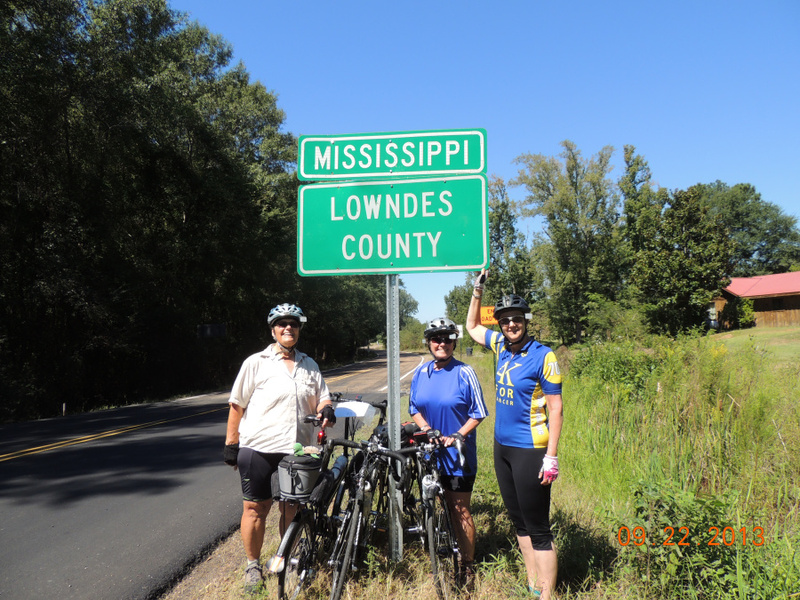 Thanks for joining me as we travel into West Point, Mississippi. The schedule looked brutal, and in fact, really was. Long mileage days and extremely hot weather. Towns with services in this part of Alabama, were few and far between, and when we did have lodging, the amenities were lacking. From Daphne, to Grove Hill was 93 miles. Mary Jane and Ramona got in the car after 70 plus miles, gasping from the heat and high humidity. 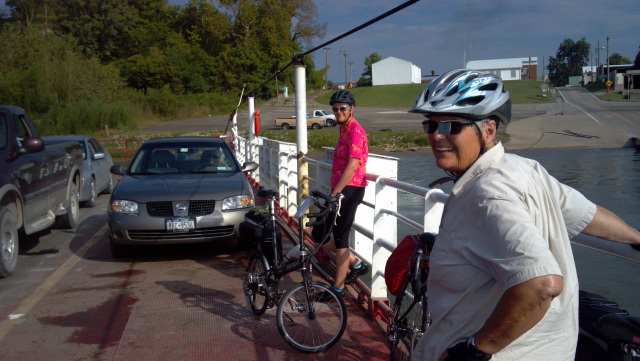 Jane, the EFMer, continued to peddle after we high-tailed it to our motel. We went back for her before it got too dark, but she still managed to clock 90 plus miles that day. 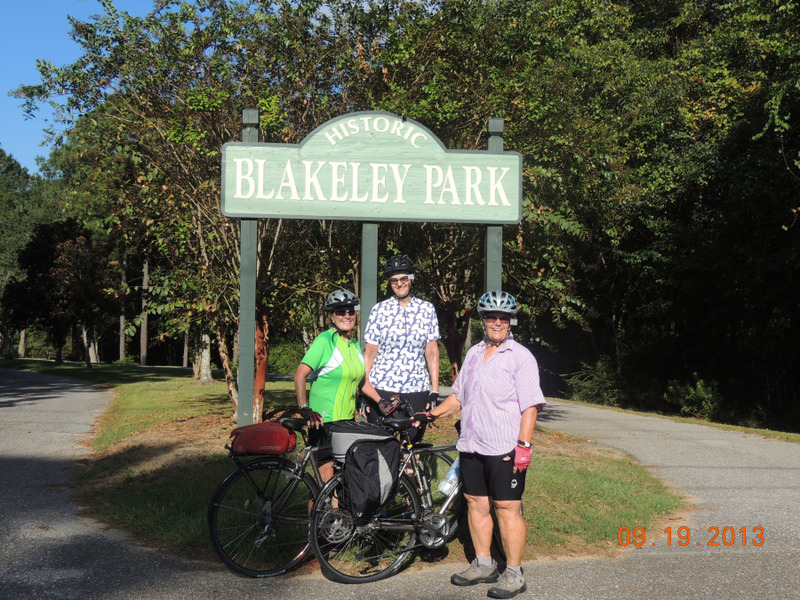 We passed by Blakely State Park, where the last battle of the Civil War saw nine black regiments of United States Colored Troops fight on the Blakely Battlefield. We also saw Montgomery Hill Baptist Church that contains a slave gallery which gives a historical statement of the social arrangements of a slave-owning society. After two days of blistering heat, Saturday we awoke to a steady warm rain. 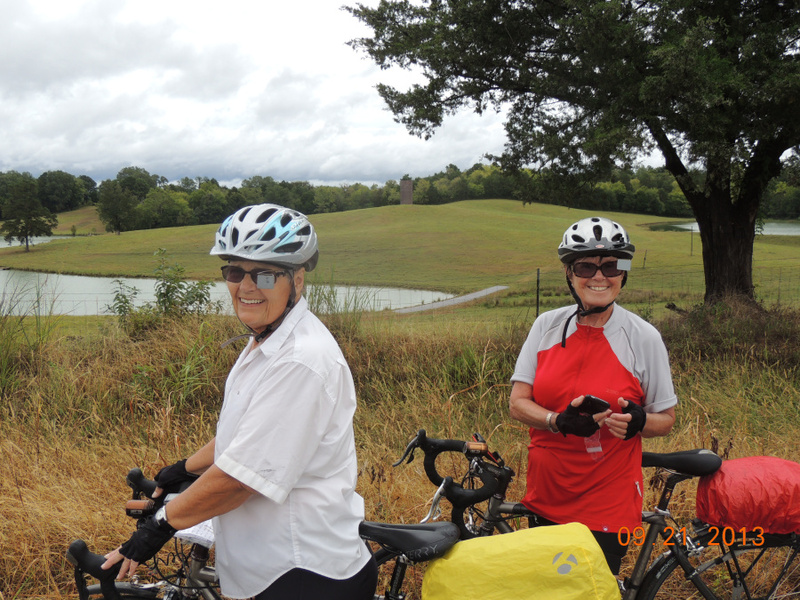 The 81 mile route to Aliceville looked much like the previous 150 miles. Remembering the lame lunch we had on Friday we bought footlongs at a Subway shop before we left town and put them in our cooler, which turned out to be a brilliant and tasty plan. Off we went in the rain, and in less than an hour, it was coming down so hard, the wipers on the car were at full tilt. On a scale of one to ten, the downpour was a 9 1/2. Eventually the rain stopped, some of the clothes dried, but parts of their apparel remained sopping wet for the duration. 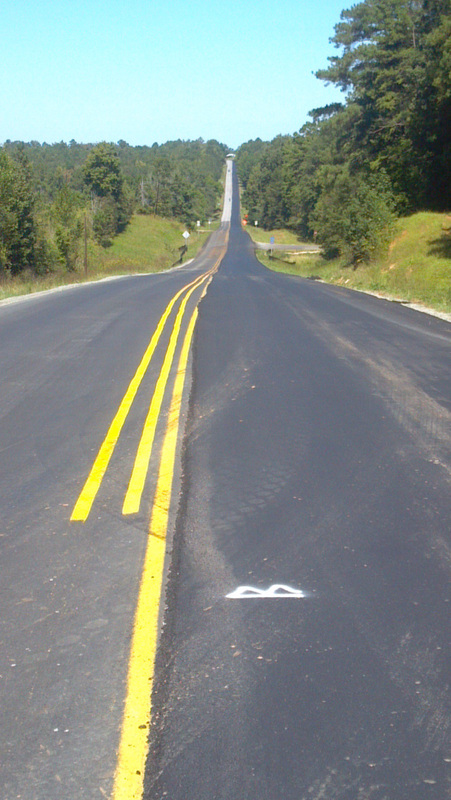 Note that the right side has been newly paved, the left side not as yet. Luckily there was not much traffic and because of the “wide open view” we were easily visible, enabling cars to readily see us. With the steep decline we were able to get a good start on making it all the way to the top without too much trouble! Sunday morning as we get ready to depart from Aliceville, Alabama, for West Point, Miss. The downpours the day before washed the oil off our chains! We always have chores to do on the layover days and we had a pile of laundry to deal with on this particular one. 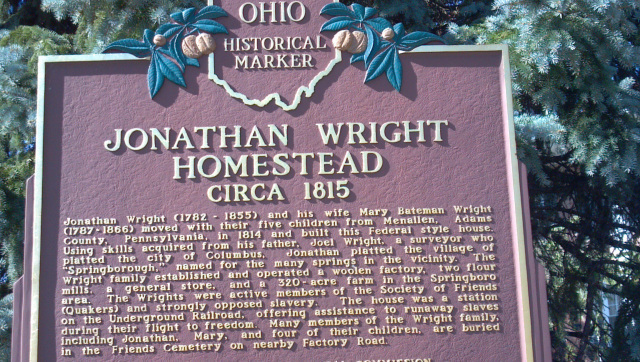 Additionally, we failed to stop and see a couple of the suggested Underground Railroad sites when we went through Columbus, so we all got in the car and backtracked. The public library in Columbus, is an amazing hub of activity and houses an archived collection of slave documents, newspaper clippings and other impressive slavery artifacts. We learned that Tennessee Williams was born there, so his books and ephemera from the movies that were made from them, were proudly displayed. We also stopped to see the Concord CME Church, established right after the Civil War, and the Missionary Union Baptist Church, which is the oldest African American church in northeast Mississippi. After lunch at a local cafe which had been recommended by one of the librarians, we were off to get the laundry done in serious. 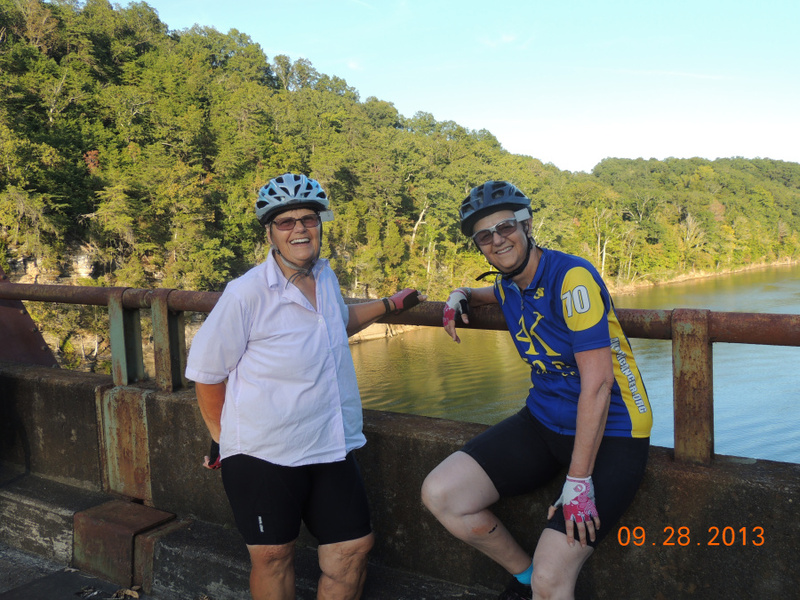 (We learned on our last day off to do the laundry earlier in the day and not leave it until evening, especially when one has to be up early and ready to conquer nearly 70 miles on the bike the next day!) The laundromat was air conditioned, a nice treat given that in past years, spending time at a sweltering laundromat was something we dreaded on our days off. When we returned to the outside air, we were reminded of the sweltering conditions, especially when one stood still for very long. We were refreshed after finding a yogurt shop offering several flavors of the soft stuff, plus topping galore! A wonderful treat for ending our day. BTW, we saw the cheapest gas of the trip thus far on the way to Columbus: $3.06/gallon. We suspect that prices will go up as we head north. Tomorrow: 68 miles to Fulton! We’re ready! A little cloudy, but what a beautiful, scenic road! Who could know we were in for a downpour just a few hours later? By now you must be getting the idea that crossing the country on roads that are conducive to bicycling, is far different from taking the Interstates. No Starbucks, Golden Arches, Texacos or Holiday Inns. Not much of anything, actually, and how true that was when we got to Iuka, Mississippi, to spend the night. We holed up at the only act in town (and some of us wished we’d slept in the car) For starters, the room we were shown smelled really bad, and the proprietor said it had been closed up for some time, which was pretty apparent. We could hear water running in the bathroom shower, and when he went to investigate, he couldn’t turn it off, but assured us (with a big broad smile) “I can fix it”. One of us emptied a bottle of water in the sink, and it didn’t go down. Calling it to his attention, he turned on the water full force, and some foreign matter spewed up out of the drain. Once again, with a big broad smile…”I can fix it”. Tired and hungry, we left our stuff and went across the street to have dinner. When we returned, his wife emerged to tell us that they had cleaned up and prepared a different room for us if we would move our luggage. Wow, that sounded promising…but really, not so much. The water didn’t leak in the shower, the sink wasn’t plugged, it had been opened and aired a bit, and the floor was drying from its recent wet mopping. But wait!!! Wires were coming through holes in the ceiling, and everything electrical was plugged into extension cords. The little refrigerator was sitting on the sidewalk outside our door thawing, because “it got left on and turned into a giant block of ice” . We checked out the beds…pillows were the thickness of the ones the airlines used to pass out. 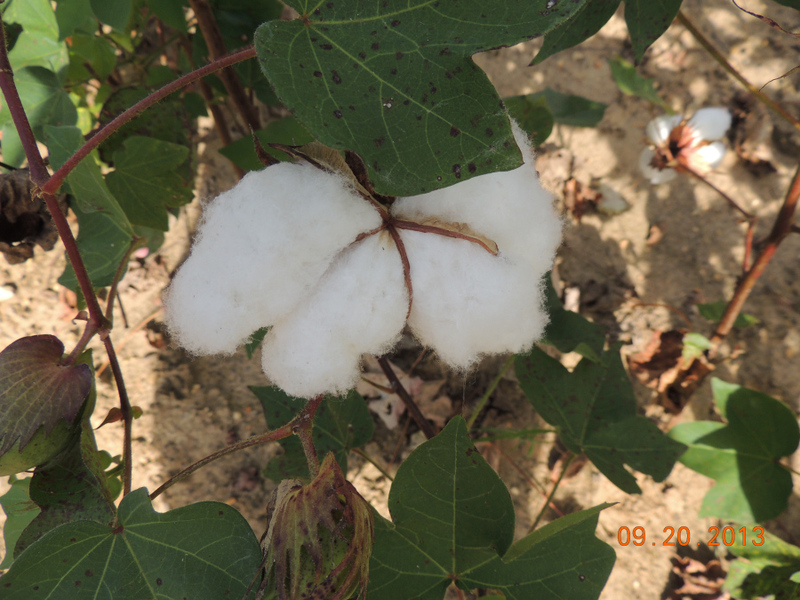 (in coach) Sheets and cases were thin like chiffon, stained and faded, but didn’t smell bad. No need to comment on the spreads, which we did our best to keep away from. We had hot water for our showers, and the towels were clean and actually dried us off, but we tried to avoid the foam rubber toilet seat that had many splits in the plastic foam. We pulled the beds away from the walls before we turned in and found an unopened can of black eyed peas and and empty carton from a twelve pack. (So much for the wet mopping) Guess it would really sound petty if we told you we had no TV or internet either. Looks like part of a movie set, doesn’t it? 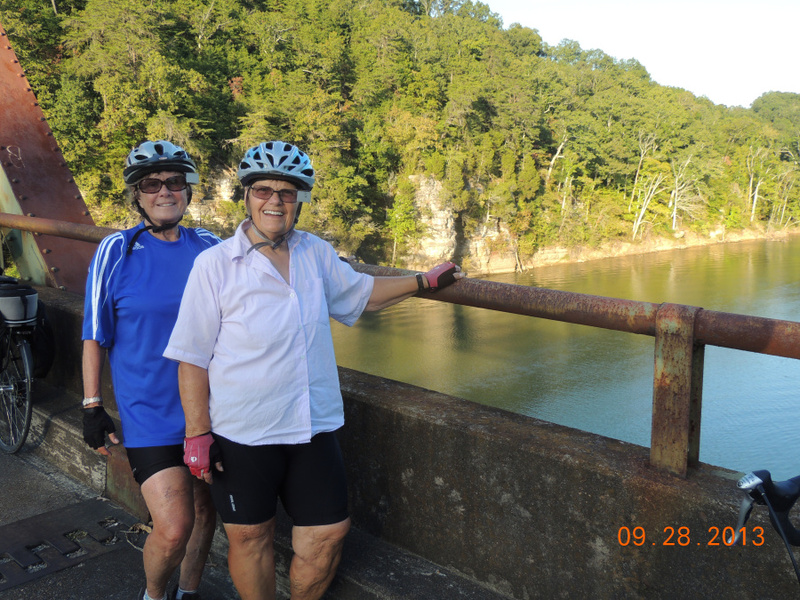 We stopped counting the bridges serving as overpasses to the 234 mile man-made waterway! Each view was as breathtaking as the last. One of the things always in the back of our minds (especially as we travel back roads) is the possibility of being chased by a dog, or in most cases, dogs. In most cases they are friendly and are seemingly fascinated by our revolving peddles which become the targets for a nip or two … not dangerous in and of unless we should lose our balance should the dog actually make impact (which doesn’t usually happen). Soon it was time to go and as we started down the road on our bikes, the dogs following us, we kept yelling to them to go back, and go home … to no avail! 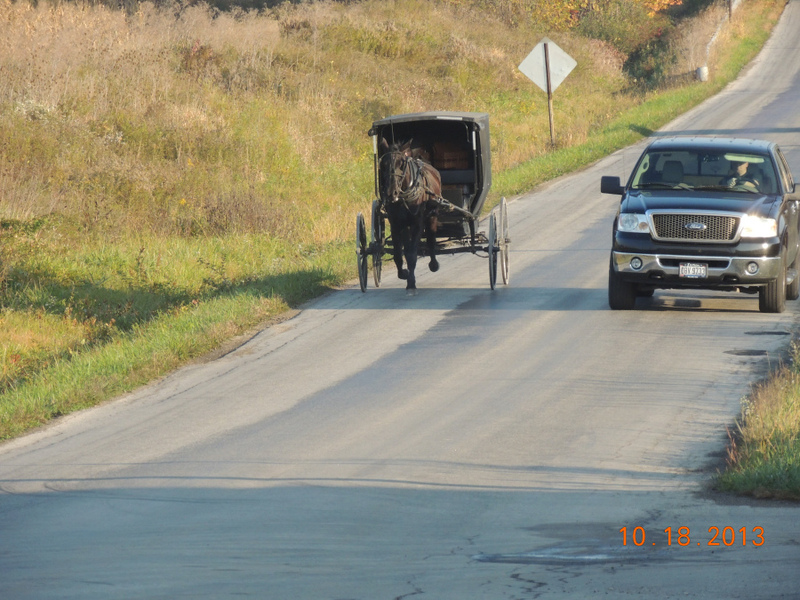 They followed us for over two miles keeping up even when we were going as fast as 15 mph! 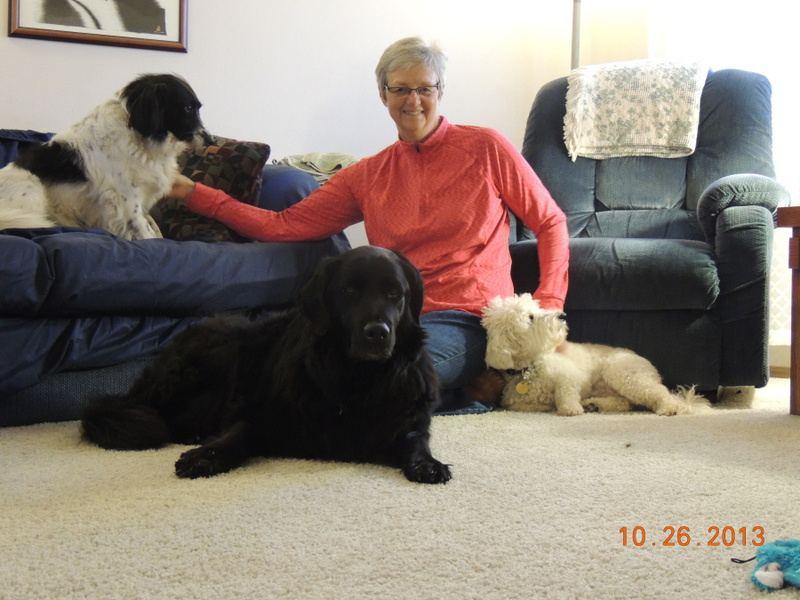 Carol was waiting for us, and the dogs immediately recognized another dog lover … as you can see from the picture, they thought they were in dog heaven, basking in Carol’s affection and warmth she showered on them! 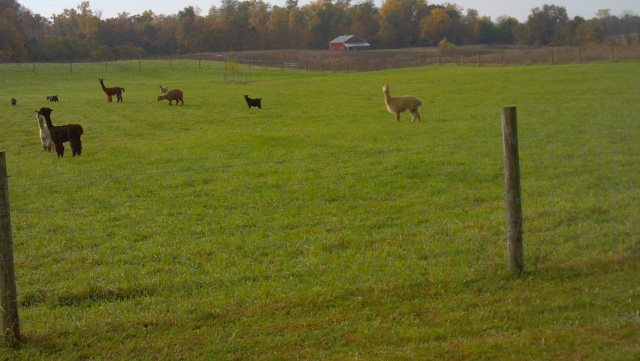 We explained our predicament (that the dogs seemed to want to follow us on our bikes). Solution: Carol tethered them with bungee cords ’til we could make a getaway, then she unleashed them and made her own get-away in the car! In the first two decades of the 20th century, more than 700 repertory troupes entertained thousands, traveling throughout the Midwest and South. 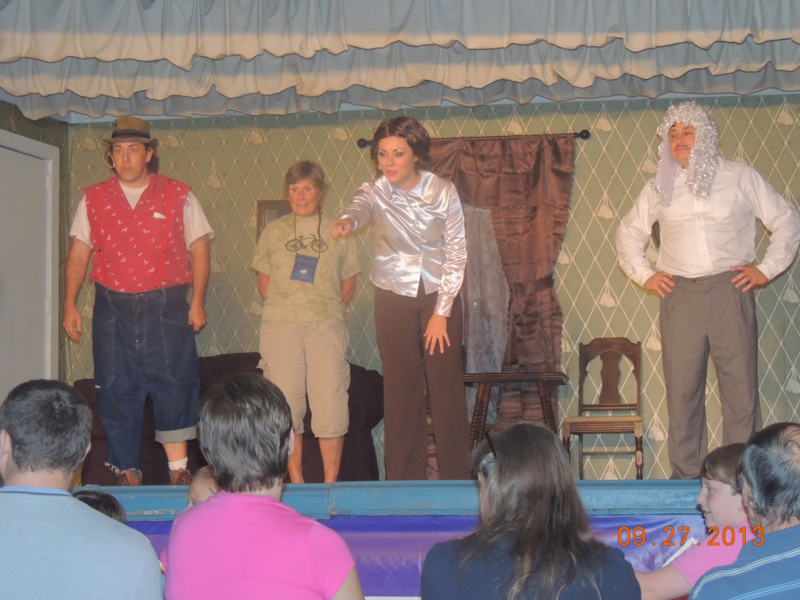 Tent shows developed out of a number of different stage styles, including melodrama, circus and vaudeville. 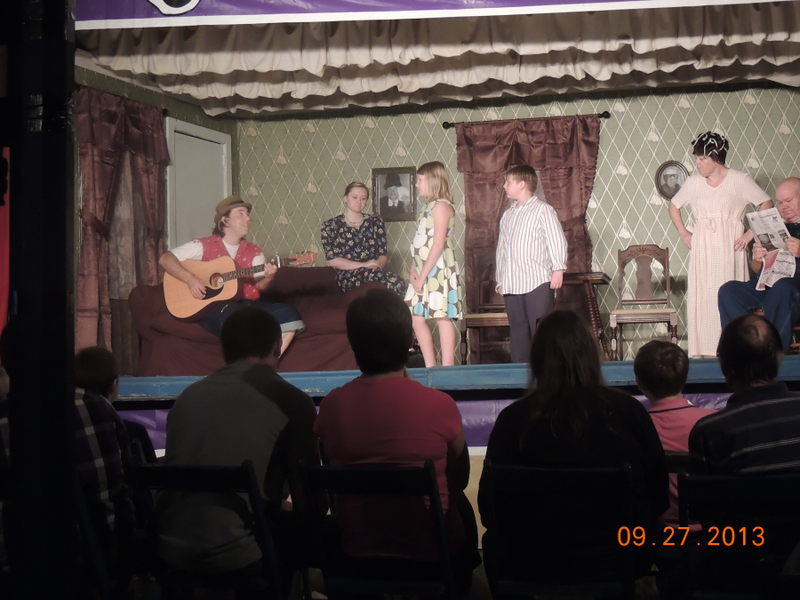 Most have disappeared but we were lucky to stumble upon one in Parsons, TN, where the community has revived the show and performs locally. with scripts and props from way back when. For three hours we were captivated by the sights, sounds, smells, but mostly the spirit of the performers doing this vaudeville show with comedy gags, music, variety acts and a bit of serious drama. At one point in the show they indicated they needed a lawyer, and one of the actors (we’d met and spoken to earlier) came off the stage saying, “I hear they have good lawyers in Oregon” and enlisted Mary Jane to join them on stage. She was to defend the lead actor who had been charged for “something” (it was never clear what). After lots of shouting among the actors on stage (while Mary was trying to figure out what it was all about) the “judge” declared that her client was innocent and that the hearing was over if she would do the proper thing and pronounce the proceedings adjourned, in Latin. She scrambled trying to think of ANY Latin words she could remember (or anything sounding like Latin!) from her High School class in that language, and blurted out, something like, “Diem, pluris bluem!” which “cracked up” the actors on stage as well as those peeking in from the side stage. Her client was obviously relieved at the vindication and high fived her, while the audience was laughing and applauding. 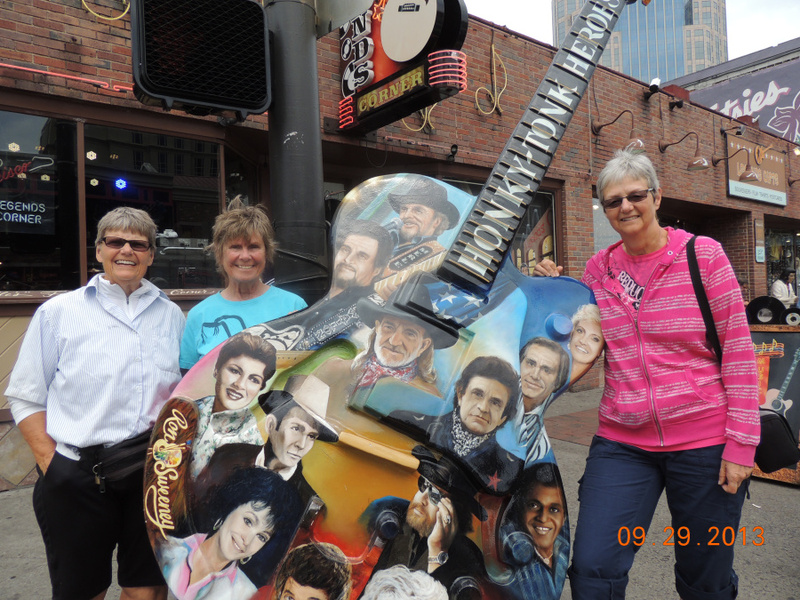 It was a hoot…we were so glad we saw their signs, stopped to investigate and attended the performance. This was small town USA in the very best sense. We just drove through to see what it looked like. It was a little late and everything was closed up tight so we just took a couple pictures and oohed and awed at the surroundings. I have always maintained that A/C in an automobile was an unnecessary luxury. Driving in the South during late summer months made me realize that is a provincial attitude, for sure. I certainly appreciate Mary Jane’s little Nissan which is fully equipped and cools me off nicely after a long wait in the heat. Can’t tell you how many people have asked if I am not tempted to be a cyclist along with my buddies (about the same number have remarked that I have the best ride of them all). In case anybody cares…the answer is NO, I’m never tempted, and YES, I believe I have the best ride also. The radio stations down here play mostly Country Western music or Religion/Gospel talk. I hit the scan button until I hear something familiar – Bruno Mars, Katie Perry, Robin Thicke – HEY HEY HEY – and since I’m by myself, I crank it up as high as it goes and sing along as I look for safe, shady spots to park at ten mile intervals. I learned early on this journey, not to stage meet-ups at the BOTTOM of a hill. Usually, the only thing the riders want or need is ice water or a piece of fruit, which is easy to provide unless we have depleted our supply of ice and there are no stores, restaurants or gas stations on our route to replenish it. 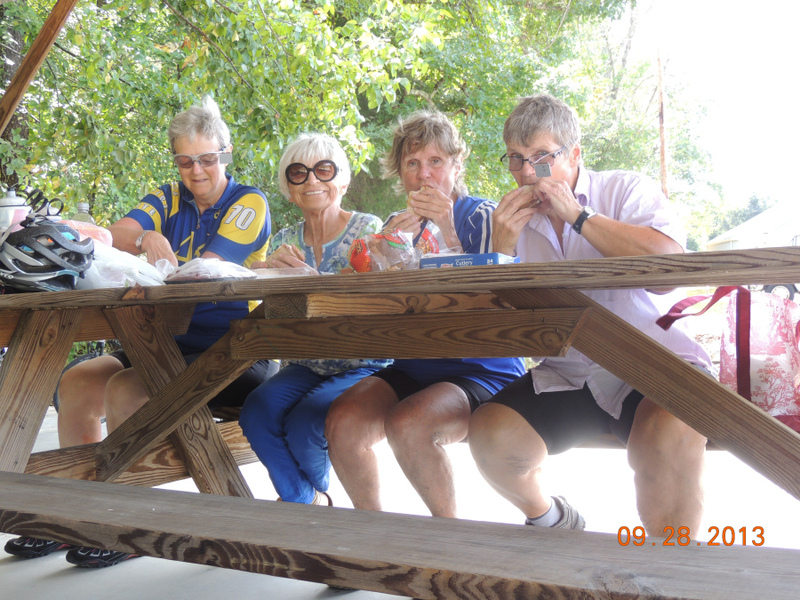 On the stretches that have no services of any kind, we eat on the road, and I thoroughly enjoy making picnic lunches to refuel these amazing women so they can continue their arduous journey. Sag Wagon is what the support vehicle is generally called, but that title is truly inappropriate for the Nissan. There have only been a couple of occasions when the bikers didn’t complete the entire ride, and that was because they ran out of daylight. They end their riding day by checking all the stats on their hi tech gadgets, comparing notes on who gets up all the hills, who rides down the fastest, the average speed, number of hours on the bike, and then plug into a formula which tells how many calories they burned. Makes my head spin, but seems to float their boats. Tracing the route of the freedom seekers is enlightening, inspiring and sobering. 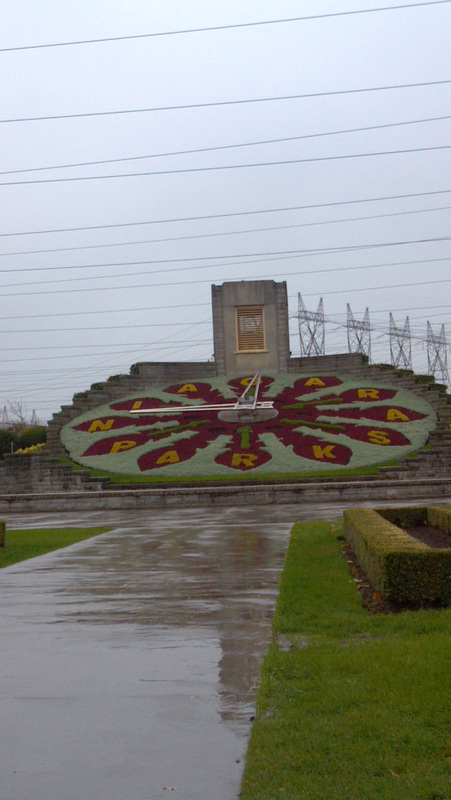 We have also traversed the Trail of Tears, which commemorates another tragic chapter in American history. On our layover days we cram in as much fun, food sampling and sightseeing as we can, which makes for a nice balance. 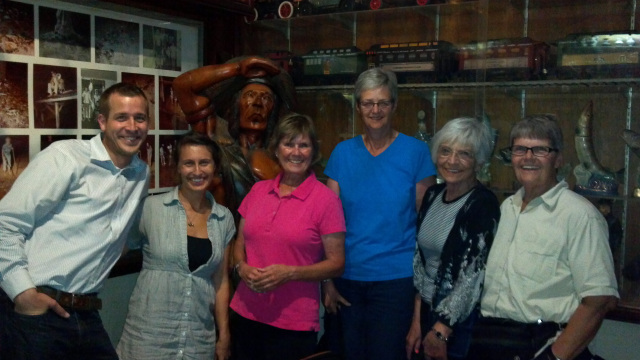 I feel very lucky and privileged to be along on this wonderful trip with good friends. 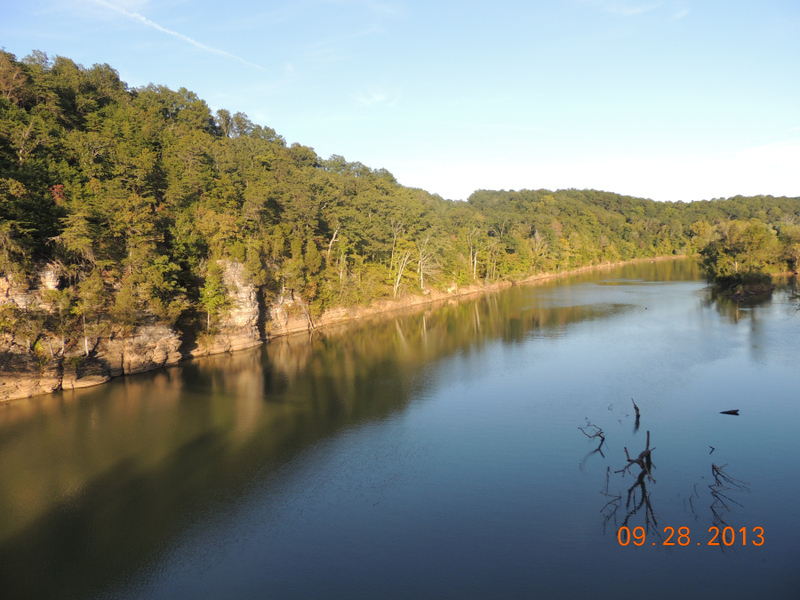 Crossing via Ferry into Cave In Rock, Ill.
We spent the night at a fantastic park there, then returned to Kentucky the following morning to continue our trek northward. The ferry ride was only about 15 minutes long. 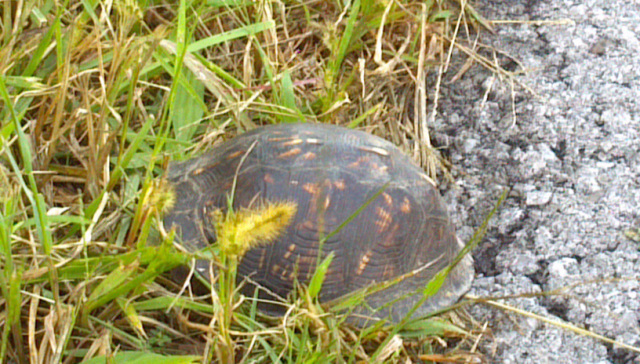 Frequently we see animal life on the roads, and many times we take pity and usher such friends to the side. Here Jane came upon a beautiful turtle and void of anything better to coax the turtle along, she resorted to using her hand pump. Another frequent sighting is “woolly” caterpillars … while we don’t usher them off the road we try to avoid running over them! Faulty Directions, a Flat Tire and a Torrential Downpour! Saturday, October 5th, started out as usual . . . a 64 mile day ahead of us. We didn’t think too much of it when we started out under cloudy skies with a few sprinkles off and on. For the first time, however, our riding directions didn’t seem to add up to where we were supposed to be. Somehow, road names didn’t necessarily coincide with what we were expecting and we took a couple of wrong turns. To make things worse, one “local” gave us a bum steer, advising us wrongly. No big deal, except we added a few unexpected miles to our day and lost some valuable time which we could have used, in retrospect. At lunch time, Carol offered to make us another round of her gourmet sandwiches, but we voted to hit a restaurant instead, which again, in retrospect, turned out to be a big mistake. Not only was the meal not all that special, but we lost more time than we could afford. Refreshed nonetheless, we got back on our bikes. Things went well in the afternoon until . . . our first flat tire occurred . 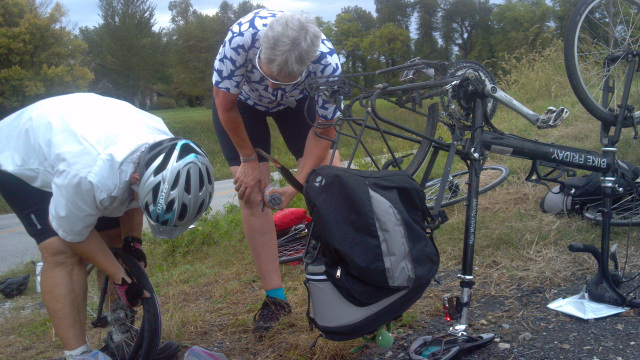 . . after nearly 624 miles, Ramona called ahead that she needed help getting her tire changed. By this time it was about 4 p.m. and we still had about 20 miles to go . . . again, not normally a big deal except . 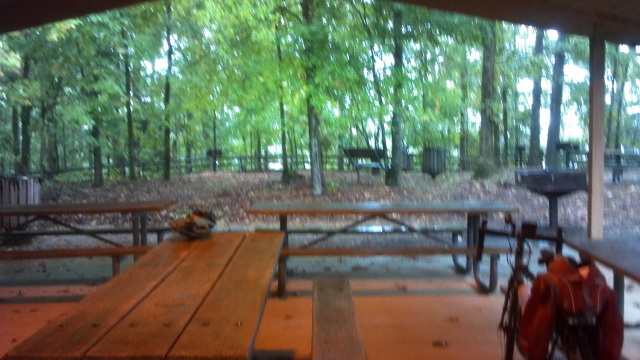 . . in an uncanny way, it started raining almost immediately after we got on our bikes! Gradually, over an hour’s time, the rain became more persistent and forceful until we were involved in biking in torrential downpour! There was no shelter we could spot as we became more and more drenched . . . even our leather shoes became absolutely soaked! A car stopped and asked if we were locals and when we answered “no”, she advised that we could find shelter a bit down the road at the post office. Comforting to see a friendly face offer help the best she could! 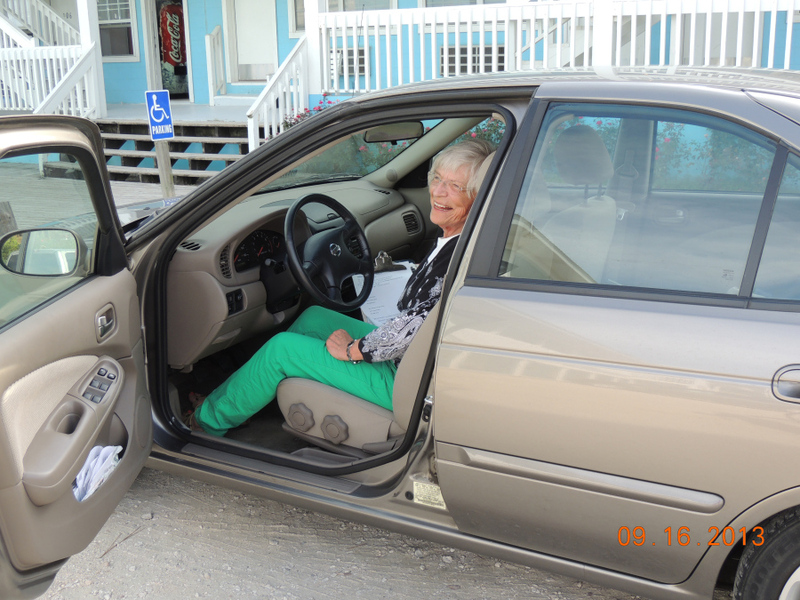 We took her advice and while stopping at the post office, called Carol who in her usual gracious way, was only too glad to pick us up after having unloaded the car. 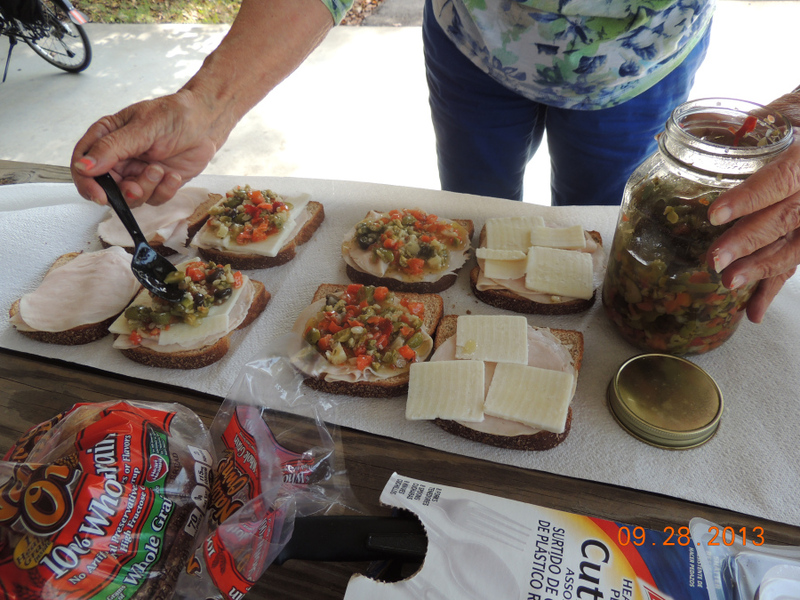 With hot showers and dry clothes nobody was interested in going out again for dinner, so we made sandwiches with the last of the muffaletta spread from New Orleans and turned on the TV. Programming was preempted with weather reports…thunder and lightning, flash floods, flooded roadways and tornado warnings in our county until 2 a.m. Grateful to be safe, sound, warm and dry for the night, we hoped there were no funnel clouds in our future. Poor Carol is sitting in the car a few miles off wondering where we are! We were wondering the same thing! A visit to Churchhill Downs. Yikes, We’re IN THE CAR! Oh yes, it does rain in Kentucky! 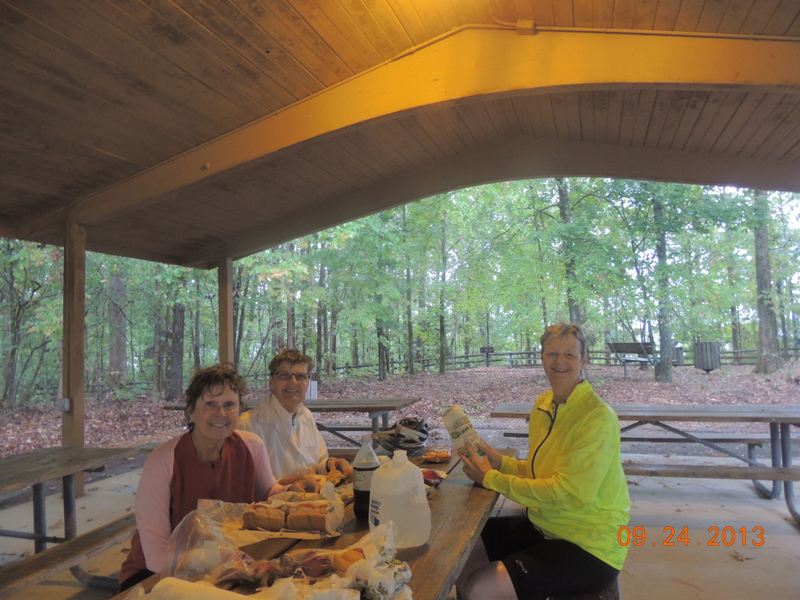 We awoke on Sunday, 10/6, to torrential rains, a very poor breakfast, and uncertain moods about biking. Our weather app on our phones showed lightning strikes ripping through solid clouds with 100 per cent chance of rain, possibly, water covered roads. What to do? 3 to 0, get in the car. Carol abstains! But, we’re not taking the freeway, we’re driving the bike route. How’s that for commitment? Let me tell you, when you’re driving up those hills and all you have to do is push the gas pedal, it makes one feel a little wimpy, I mean really, how hard would this be? Well, it takes a couple of hours to get to check this day off in the car. 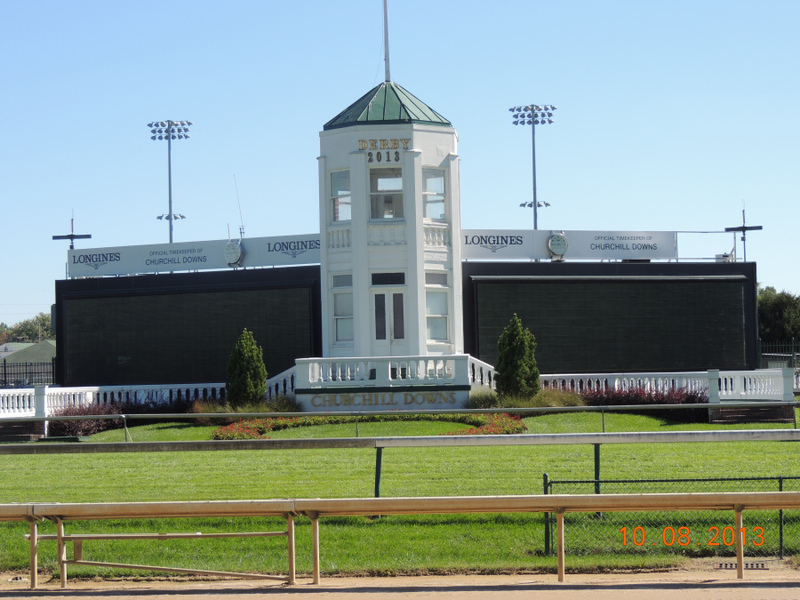 We check into a hotel in Brandenburg, KY. and then we do even more miles, we drive into Louisville. By now, you know we’re totally dedicated! 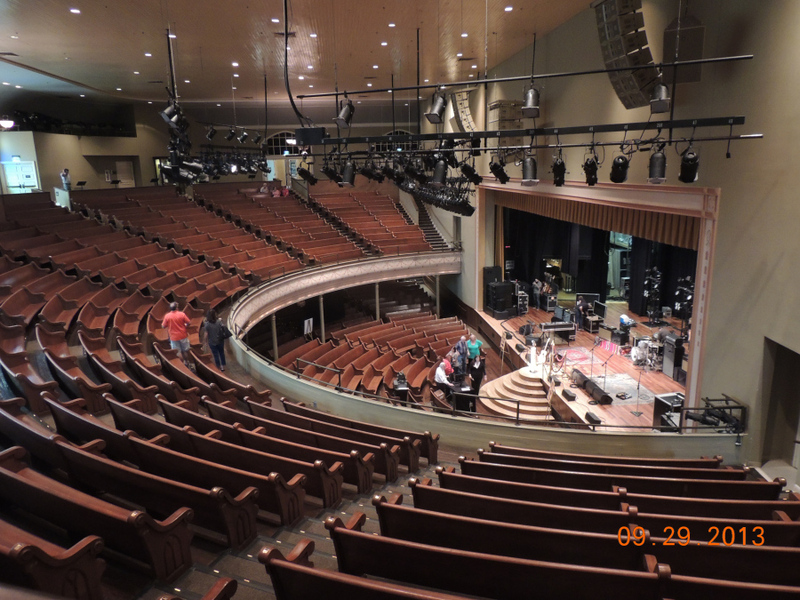 We tour the city, not exactly hopping on Sunday, BUT, we tour the Mohammad Ali Center. What an inspiration, very moving. After, we do walk a bit around the city, in the drizzle, I might add, then, we have a wonderful Persian Restaurant dinner. 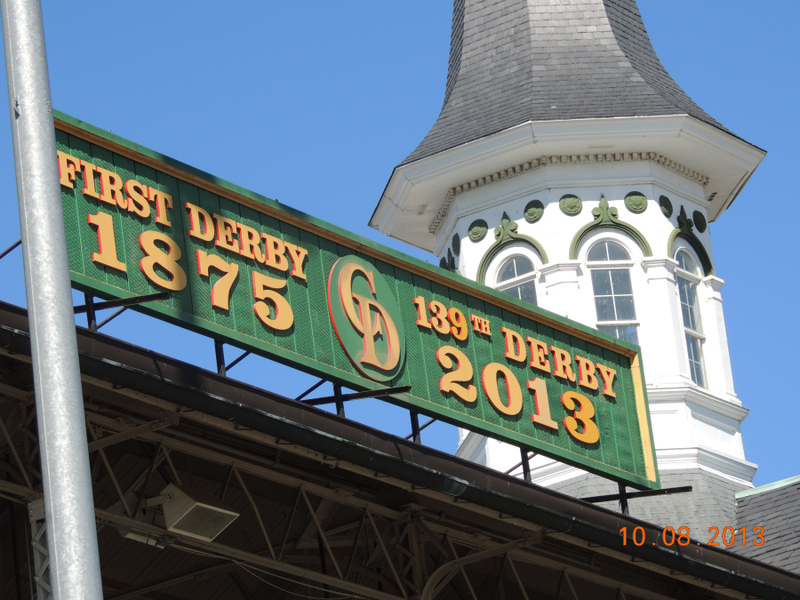 Very authentic, and wonderful, yes, this is in Louisville, KY. It’s a small world! Okay, more miles, we drive back to our hotel in Brandenburg, jump into bed, and Monday morning, we’re in our biking duds, ready to get back on the road. 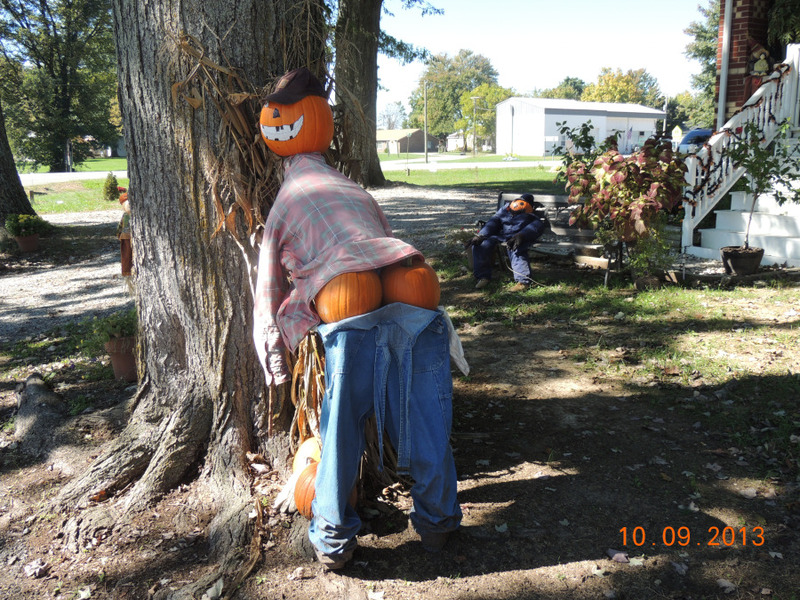 Oh, yes, and the sun is shining brightly, though the temperature, 47 degrees, reflects the feel of fall in the air, and we dug into our bags for long sleeves! YES, it feels grand to be back in the saddle! The narrow strip of land lining both sides of the Ohio River in the tri-state Kentucky/Indiana/Ohio region saw some of the Underground Railroad’s most intense activity. Over several days we crossed the river so many times on our route, we seldom knew in which state we were. The towns, museums and documented safe houses have begun to blur, however a few were remarkable. NEW ALBANY, INDIANA: The Carnegie Center for Art and History’s exhibit, “Ordinary People, Extraordinary Courage: Men and Women of the URR” was a multimedia experience with newspaper articles and ads posting rewards for finding and returning runaway slaves. 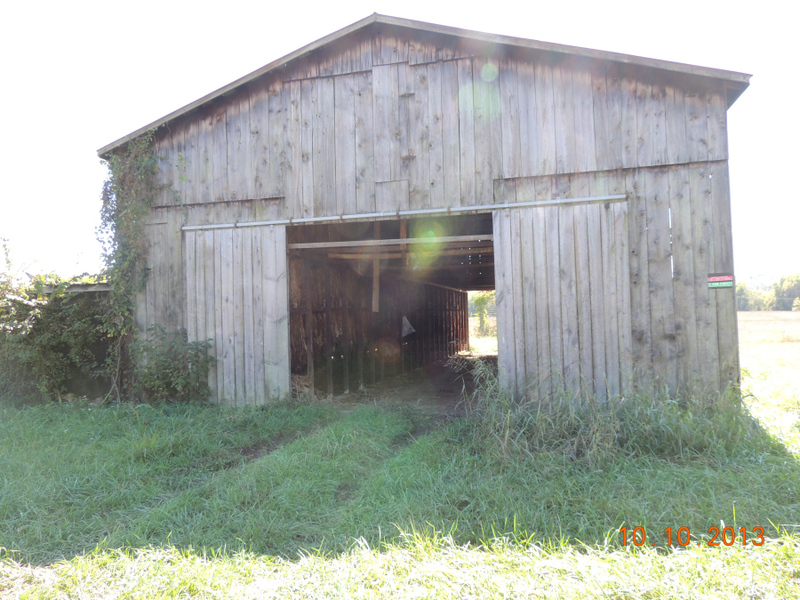 In MADISON, INDIANA and MAYSVILLE, KENTUCKY we toured houses with secret passages under flooring and between walls where freedom seekers were hidden. RIPLEY, OHIO is home to the John Rankin House and the John Parker House; the first built on a high hill and belonging to a reverend, and the latter was near the river bank and owned by a freed slave. Together the men were credited with aiding and assisting thousands. 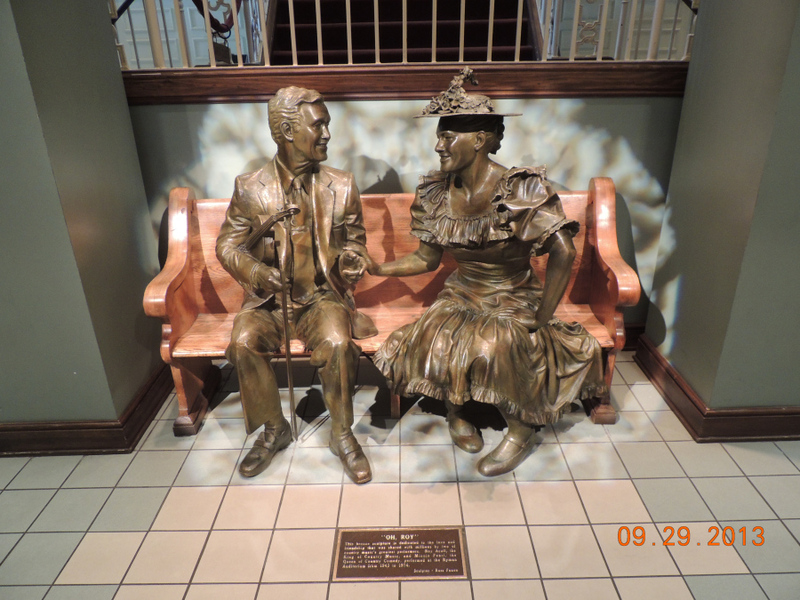 We were very disappointed when we were unable to visit the relatively new URR Museum in CINCINNATI, and the National African American Museum in WILBERFORCE, OHIO, as both were closed on the days we happened to be there. This is our 5th state and still going strong. Another Delay … Get Out Our Maps! It’s been fun seeing all the decorated houses! If we’d thought of it, it might have been fun to count CEMETERIES as we passed them, since many seem to be located in the outskirts where we ride. In the southernmost states, we could spot them from miles away by the profusion of color, which turned out to be bouquets of plastic flowers on what appeared to be every grave. (Judging by the plastic decorations we noticed elsewhere, both inside and outdoors in these same states, we figure that Michaels and Joannes must be doing landslide business) Later in our journey the difference was remarkable…not merely fewer flowers, but perfectly bare tombstones. 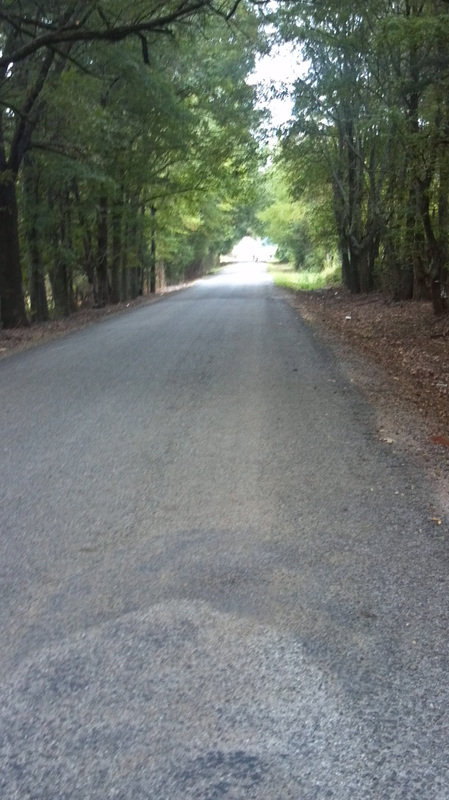 Other unusual sightings (for us) in rural Mississippi, were what looked like open cages next to the road at each and every driveway. 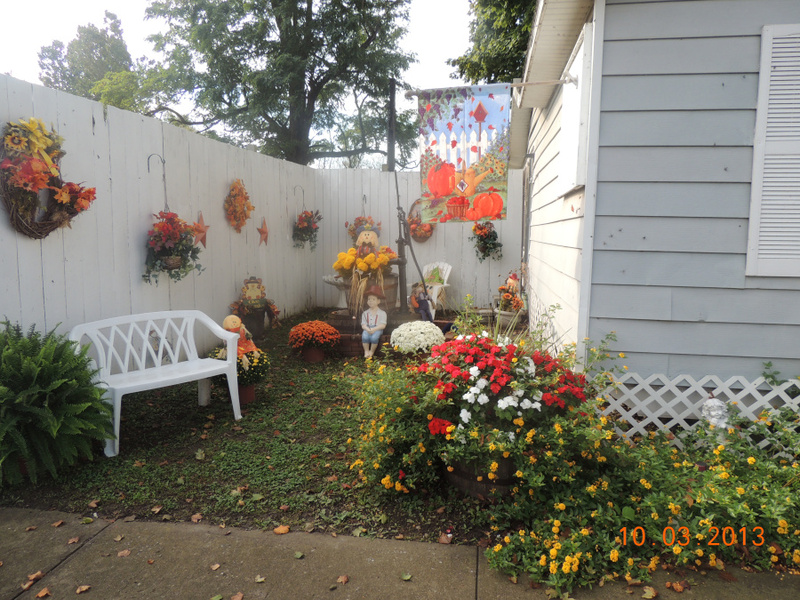 The corner posts of the approximately four foot cubes were anchored into the ground, and the sides were made from chicken wire, wrought iron fencing, pickets, and/or siding to match the houses. Once again, as we got farther north, the GARBAGE and RECYCLE BINS began to look just like ours. 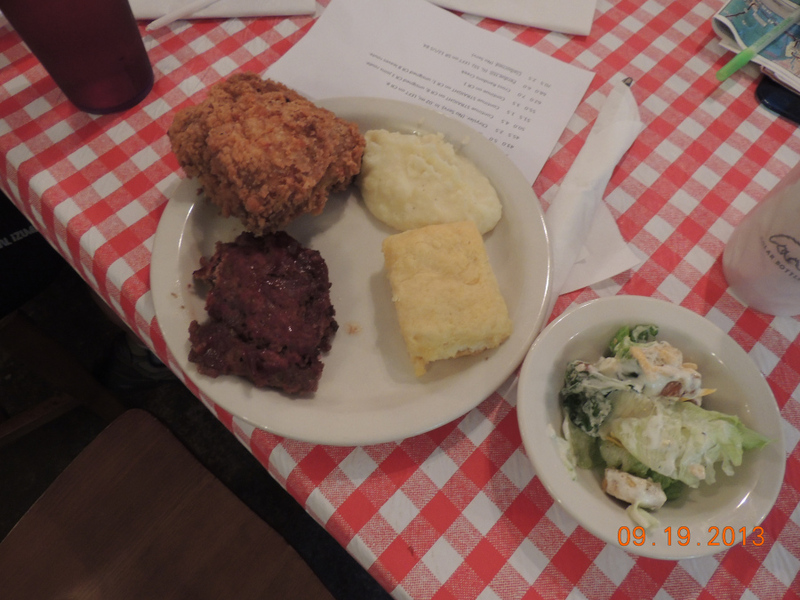 We fully expected that much of the food south of the Mason Dixon Line would be deep fried, and that was a given, so no surprises there. However, in Parsons, Tennessee we sampled CHOCOLATE GRAVY, which is like runny chocolate pudding, but not quite as sweet. Additionally, we were introduced to GOETTA at Dave and Gina’s in Cincinnati, which is made from pork and pin oats and served like breakfast sausage. 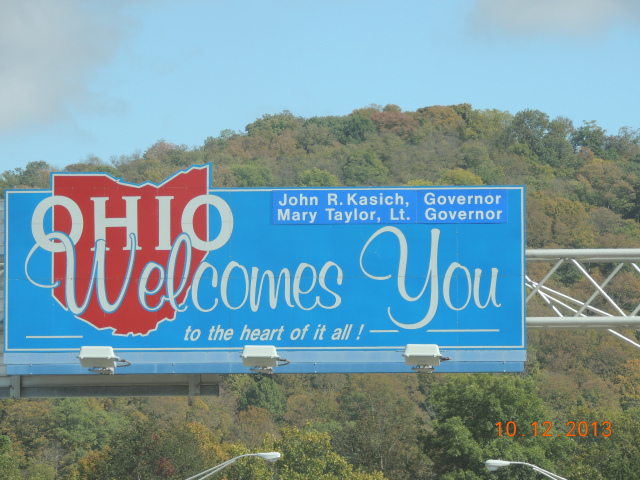 We traveled from Kentucky (Mayesville) to Ohio, aiming for Milford, on Friday, October 11. 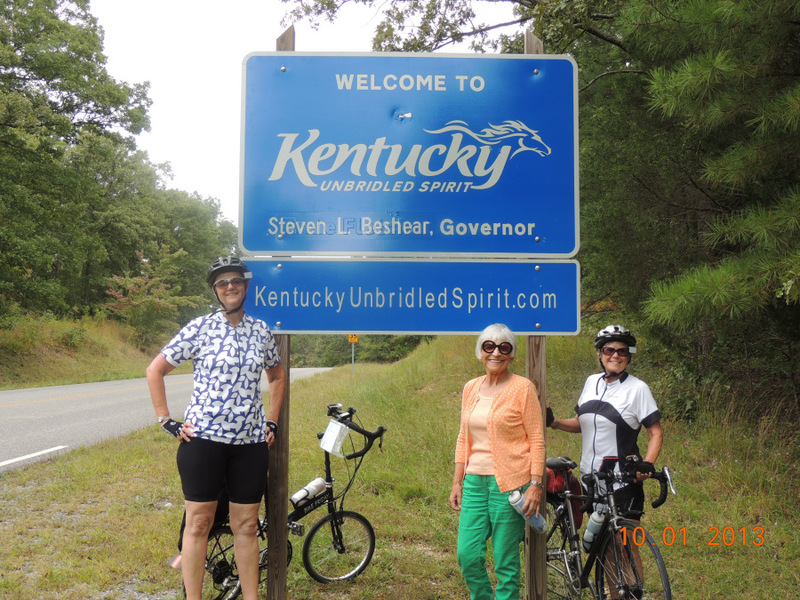 Though a rather routine 62 mile ride starting out, we found ourselves getting lost more than once, resulting in our encountering several dogs early in the day on Kentucky’s back roads. After Jane got nipped on the hip by one of the dogs, and we didn’t seem to be making much progress reaching our destination, a further study of the map revealed that we could get to Milford much more directly via a different route. Carol was in touch with her son David, and his wife, Gina, who live in Cincinnati (near Milford). While we were planning to stay with them the next night, they insisted that we come directly to their house and stay two nights instead of just one. Their gracious hospitality more than made up for the difficulties we had encountered during the day . 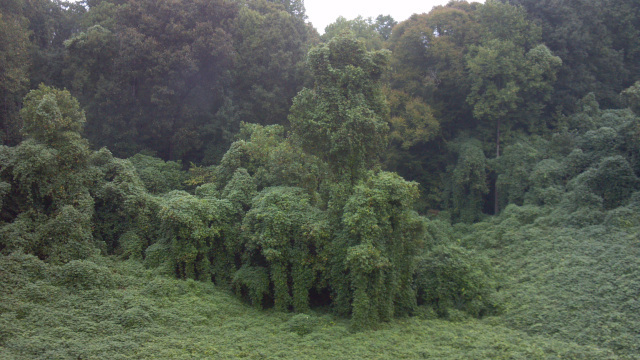 . . those rude dogs of Kentucky, the lost time figuring out the map, to say nothing of the unkempt roads we had been on. 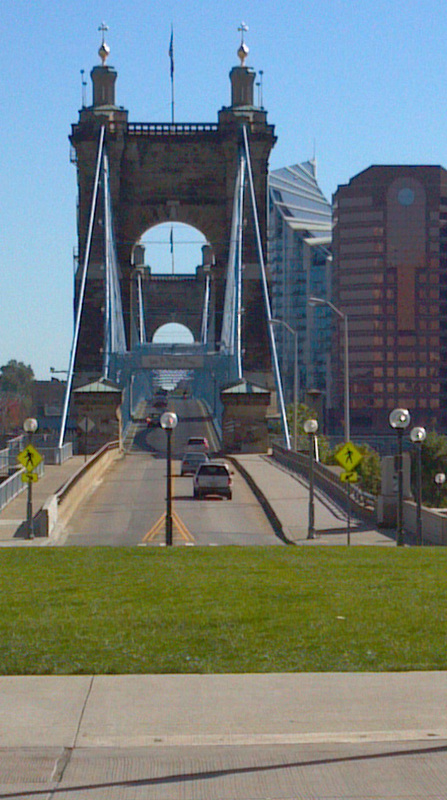 Alas, the hills of Cincinnati are a force to be reckoned with, to say the least. Most challenging of all was the hill that David and Gina live on . . . WHEW! Something like going up the side of a tree! But as I said, their graciousness more than made up for our wanting to just collapse when we reached their doorstep! Another wonderful part of our visit with them was the box of home-made chocolate caramels, made and individually wrapped by Carol’s daughters and granddaughter. They had arranged to have the package arrive in time for our arrival. 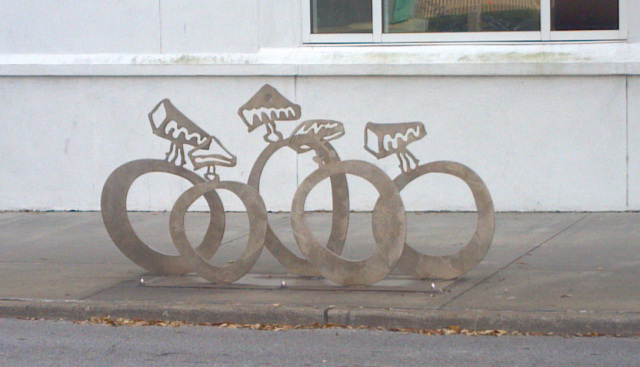 A definite picker-upper when we needed a boost on our bikes! We spent Saturday backtracking (by car), to seek out Underground Railroad sights we hadn’t had time to see, including the home of Rev. John Rankin, an abolitionist who with his wife, situated their house atop a 540 foot hill on the Ohio River. They provided a safe house for hundreds of slaves using lantern signals as boats came up the river. The place is undergoing renovation and interestingly, an underground tunnel has been discovered on the grounds linking the house to another edifice on the grounds. Amazing the efforts the committed abolitionists went to in furthering the freedom of runaway slaves. On Sunday we were given a gracious send-off (e.g., Gina was up at 5 a.m. preparing a hearty breakfast for us!) As well as their hospitality, we so enjoyed hearing all about Cincinnati from David and Gina; their passion for the city was palpable indeed! Off on our bicycles on the Little Miami Scenic Trail, a fifty mile paved rail-trail, we made our way to Springboro, where my (Mary Jane’s) cousin Louise and her husband, Mark, reside. 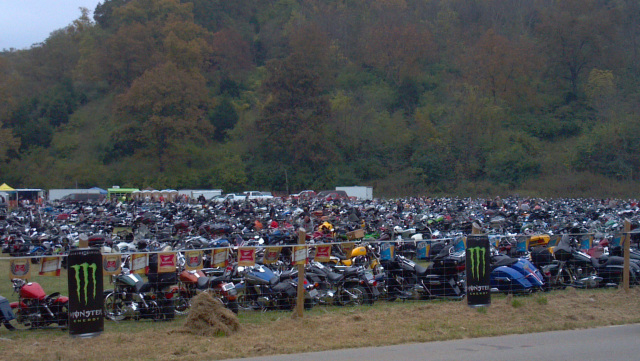 A few miles prior to arriving in Springboro we encountered a motorcycle event, “Devil’s Staircase”; I have never seen so many motorcycles assembled at once! The occasion was a competition to see who could manage their motorcycles up a very steep (non-paved) hill. 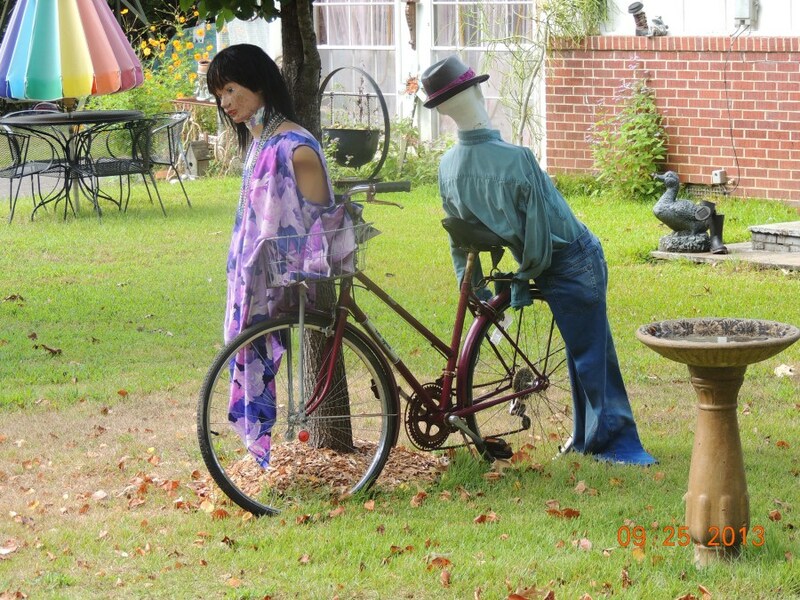 After lingering to enjoy the energy and ambiance of the motorcycle event, we were in for another treat upon arriving at the home of Louise and Mark . . . they couldn’t have been more gracious. And we were in for another surprise: my daughter Julie had arranged to have a package of homemade “breakfast” cookies (packed with oatmeal, Wheaties, nuts and candied fruits) sent to Louise and Mark for us. Another delicious, nutritious pick-me-up while on the trail or not! 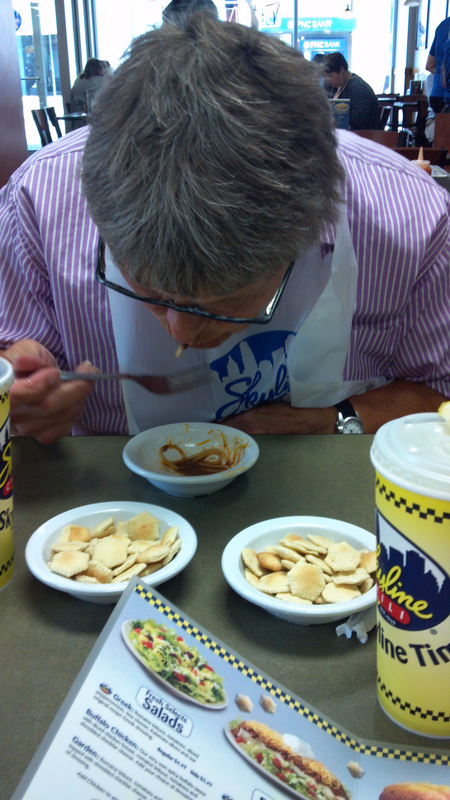 We used Monday, the 14th to drive to Cincinnati and see its sights, some non-URR related such as the Cincinnati Reds Museum, and we enjoyed sampling Skyline Chili. A big disappointment was that museums (apparently in general) are closed on Mondays in Ohio, so we were unable to get into neither the city’s Underground Railroad Museum, nor Harriet Beecher Stowe’s House, both touted as “must sees”. 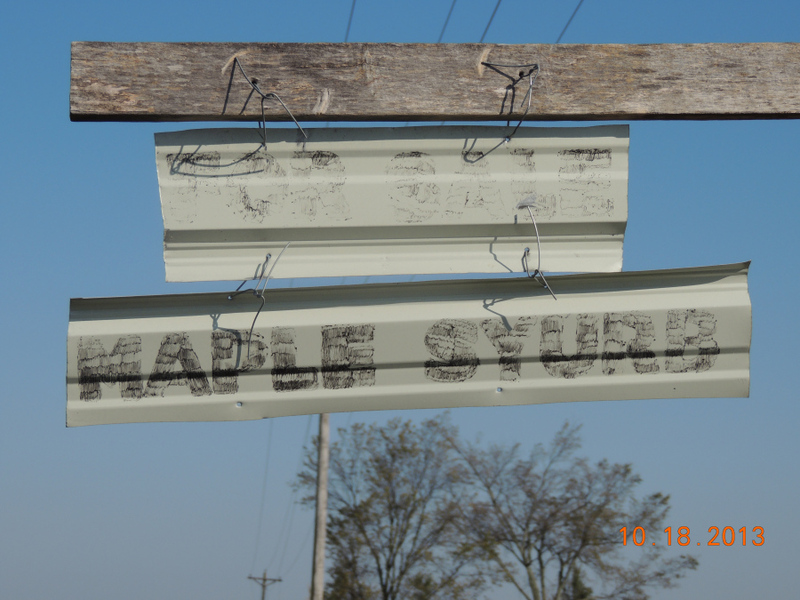 Nonetheless, we found Springboro to be a wealth of well kept history. In addition to a walking tour of historical homes and edifices, we went through the Wright House, now a bed and breakfast, but formerly a safe house for runaway slaves. Wright was a wealthy Quaker and abolitionist, who in constructing his home, had a secret area built in the center of the house enabling runaway slaves to access a ladder via a hidden opening in the upstairs floor when the house was being inspected by authorities for runaway slaves. 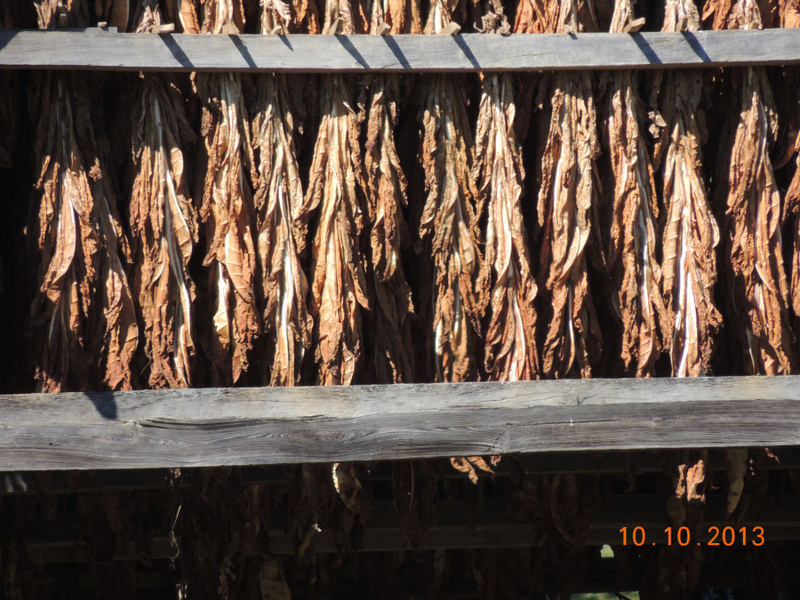 (Most hiding places were in a pantry, or attached building on the grounds.) Again, we were/are so inspired by the efforts the abolitionists went to in effecting the safe travels of the runaway slaves. As well, the resiliency of the runaways cannot be ignored. 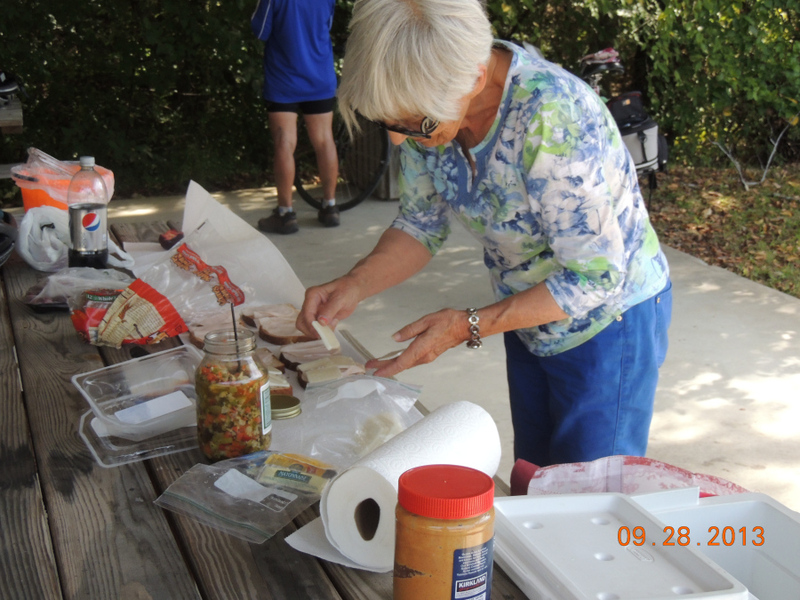 For our send-off from Springboro, Mark was up at 5 a.m. filling our ice chest with ice, and Louise was busy making sure we had lunch ingredients. Certainly the visit with our two families were a highlight of our trip! 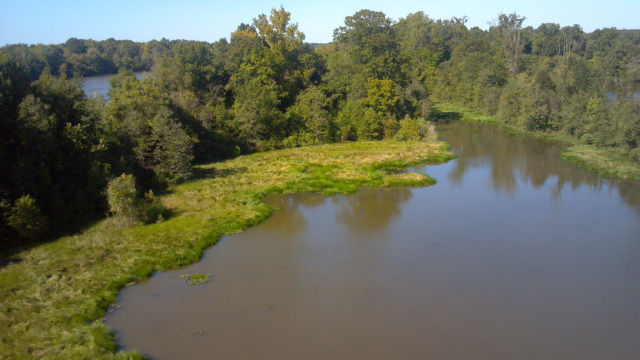 We again rejoined the LMST, enjoying the beauty of its ever-changing landscape, including its rolling farmlands, picturesque landscapes, river cliffs and hardwood forests. A delightful ride to be sure! 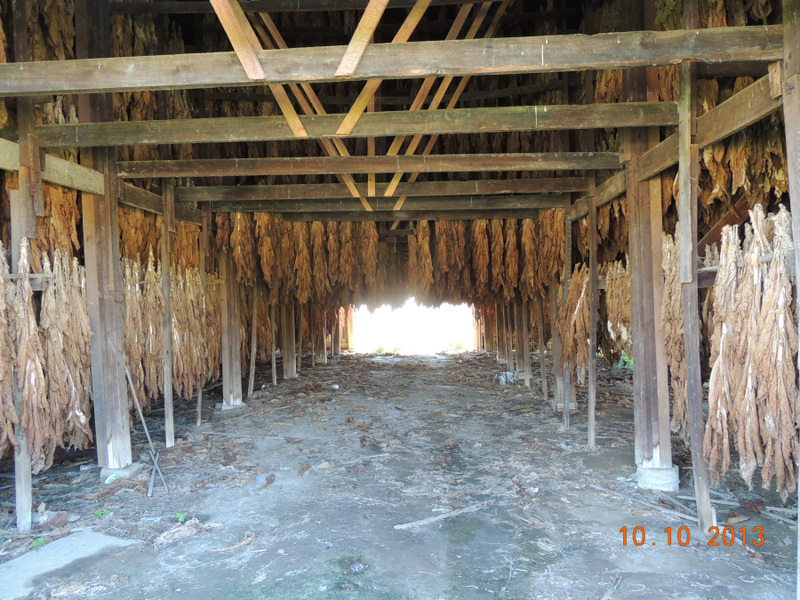 Oberlin, OH., was really our hot spot for the Underground Rail Road. 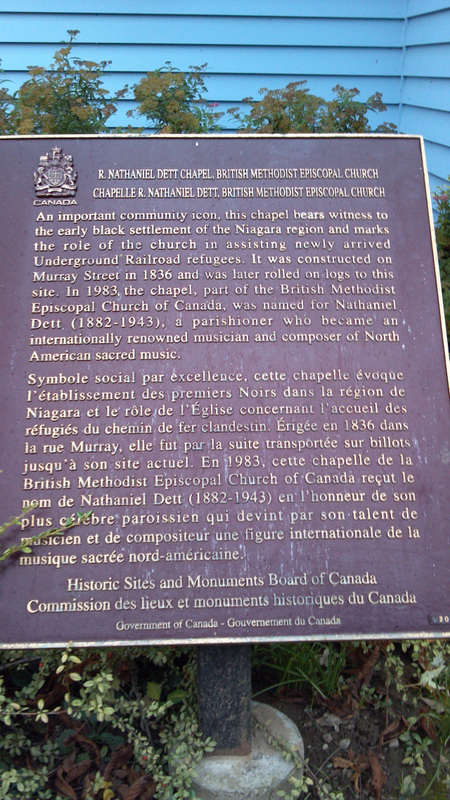 There, we found there had been Quaker communities and Slaves who thought they were free, who were instrumental in moving Slaves north into Canada. In brief, it was the law anywhere in the USA, if a run a way Slave were captured by a bounty hunter, they could be returned to their owner and the bounty hunters received payment. 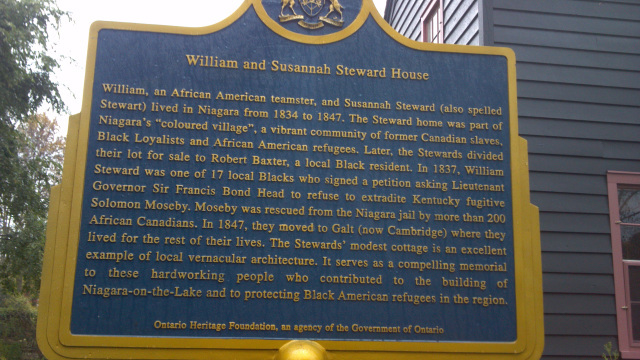 On the route that we biked, home after home in Ohio, Pennsylvania and New York helped Slaves get to Canada. There were many other routes as well, but all lead to Canada. Often, even African Americans who were born in the North would be captured and taken to the South and sold. 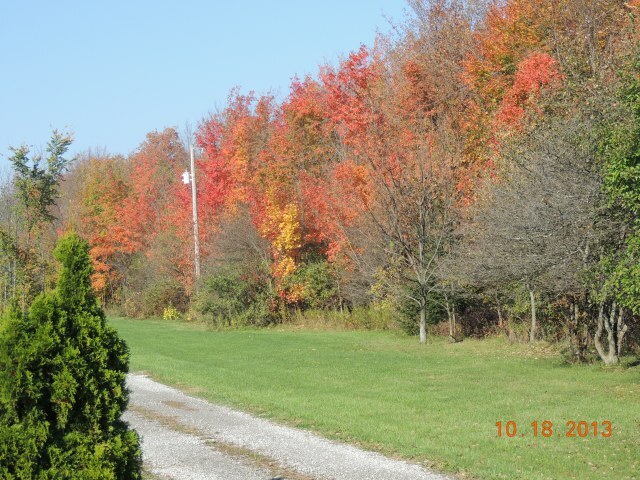 We traveled through Ohio, fall trees in transition, the rolling hills losing some of their pitch that we’d had in Kentucky and Tennessee. 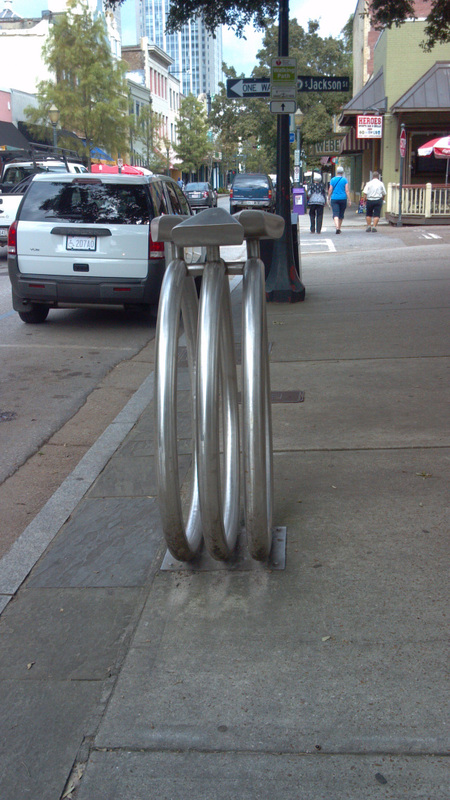 One of the best parts for me about biking, is going through towns, both large and small. Seeing the housing, neighborhoods, schools, traffic, shops and many residents waving and shouting hellos. Passing a school bus is always a joy, kids yelling, waving. Honestly, I rarely understand a word they shout at us, over the roar of the vehicles and the bus, but I always am certain that it’s all good! Riding over a bridge is a very fun adventure, many are narrow, usually a quick up and down, and up and lots to look at as you grind up and fly down. 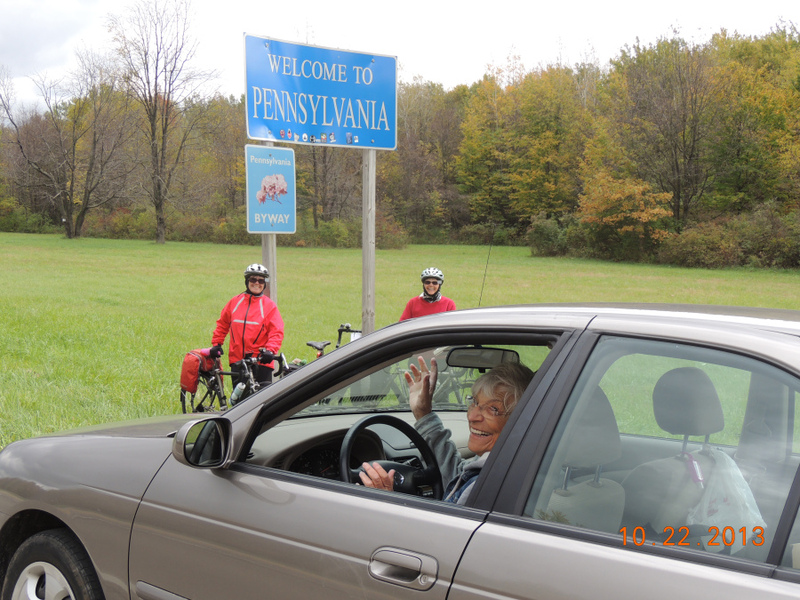 Into Pennsylvania, much like the terrain we’d had in Ohio, with a few more hills, but gentle enough climb up and still have breath enough to begin to pedal as fast as we could to get up the next hill. 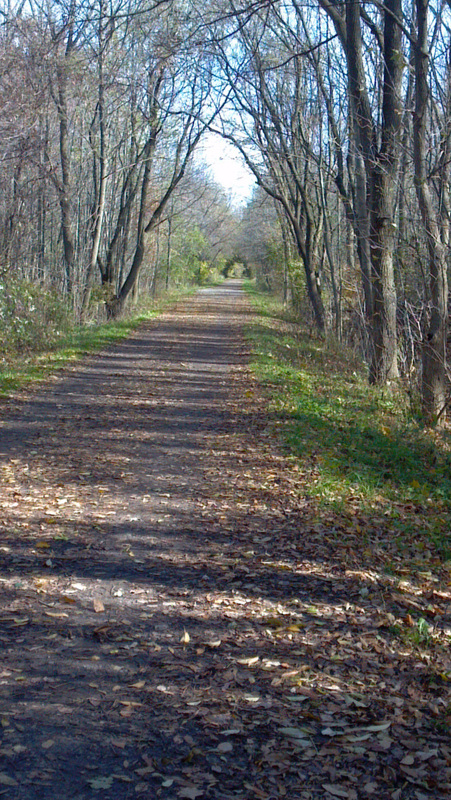 We’re only in PA. 1 1/2 days, but just after lunch, our route takes us North and we begin riding along the Lake Erie. Wow, so beautiful and BIG! 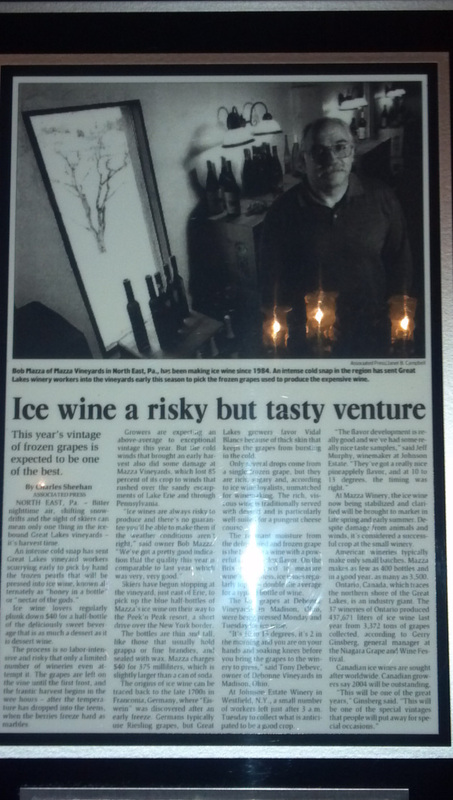 “Ice Wine” from the town of North East, Pennsylvania. I am home after leaving my compatriots to fend for themselves. I am home with my adorable dog Tucker and my sisters two dogs for the weekend. The one picture is of all of us relaxing (sort of) and the others are of Tucker. Circumstances were such that I needed to come home. I am missing my buddies and hope they are having more fun than they can handle. Today is Mary Jane’s birthday and I wish I were there to help her celebrate. Happy Birthday! 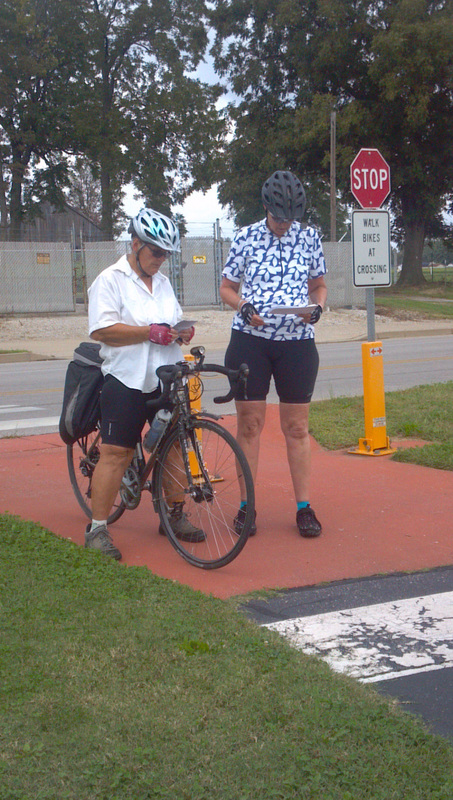 I know Jane can handle the mapping and Carol will continue to take care of them on the road. Mary Jane, our reservationist extraordinaire, will keep the motels in line getting queen beds, no pets, no children, no smoking and a place for the bikes. Keep the rubber side down. I miss you guys more than you know. Into New York, still riding next to Lake Erie, we roll into Dunkirk, N.Y. for the night. 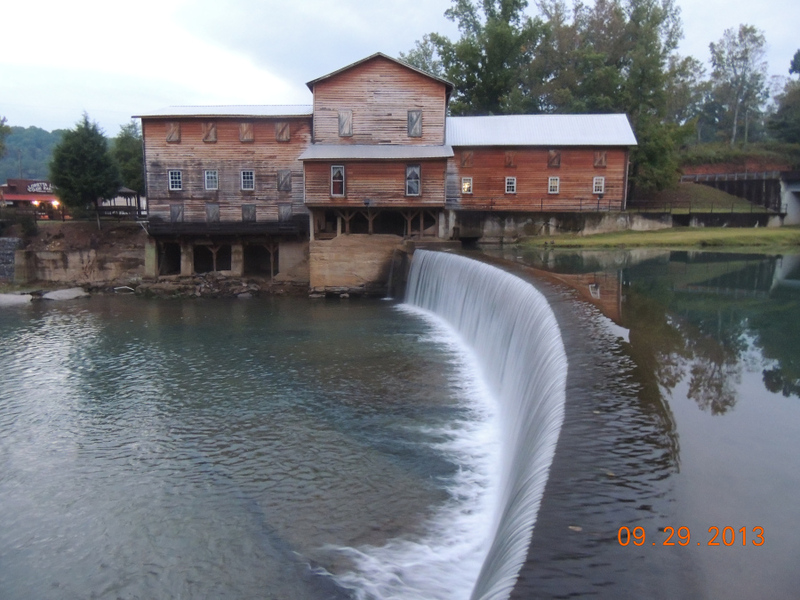 It seemed, many creeks and small rivers had small water falls, quit beautiful. The fields were alive with vineyards and corn. 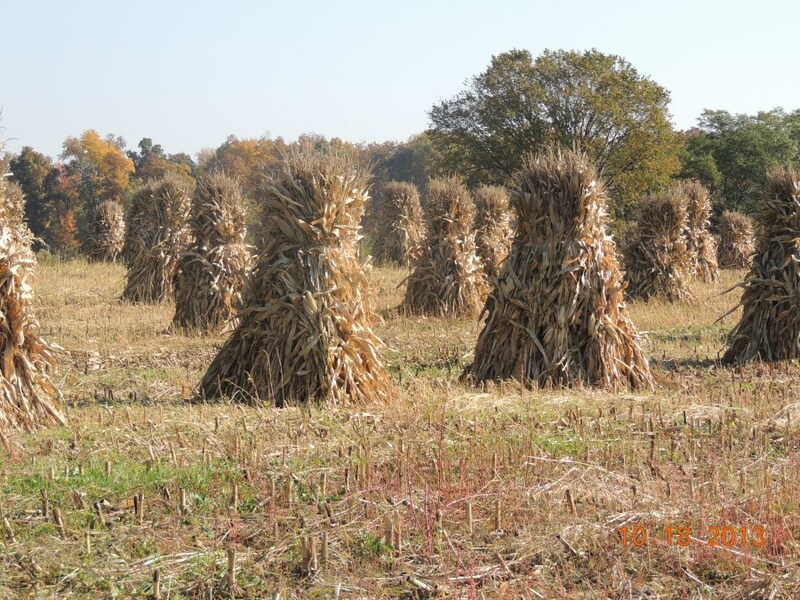 Much to my surprise, they were just harvesting the corn, but the further north we rode, it was still standing tall. 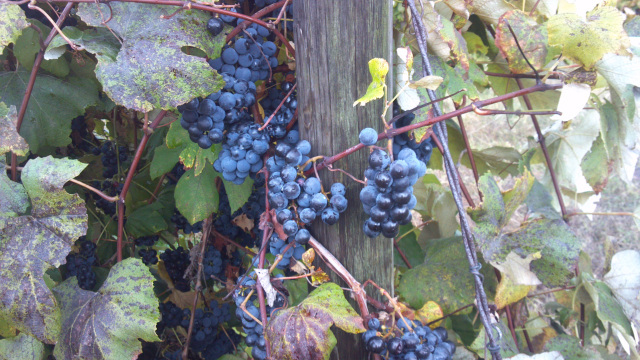 Knowing little about grapes, I was surprised to smell them on the vines in late October, but visiting a winery, we were told that this was the time to harvest grapes, unless they were making ice wine. Then the grapes would be picked by hand when solidly frozen after a very hard freeze, usually in January. Even the overcast skies and dulled colors of the leaves couldn’t blunt our appreciation of some of the beautiful scenes along the way! While actual museums and artifacts were sparse in Canada, we did encounter commemorative markers. Riding through Buffalo, we exit the USA, by crossing over the Peace Bridge. 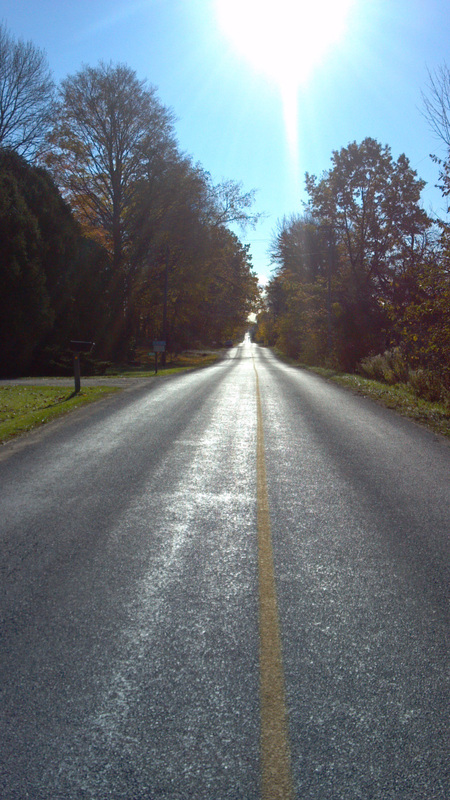 There we begin a 20-mile ride on the Niagara recreational trail into Niagara Falls. Absolutely beautiful. We are cooling down a bit, and it seems really cold when the low will be 0 Celsius to start our morning. For our last week we mainly travel through farm country, but we find towns with motels each night. We’ve been spoiled by our cell phone GPS, and since we have no data service on our phones in Canada, we do wander a bit when we miss a turn or are trying to find something like a motel with an address only! 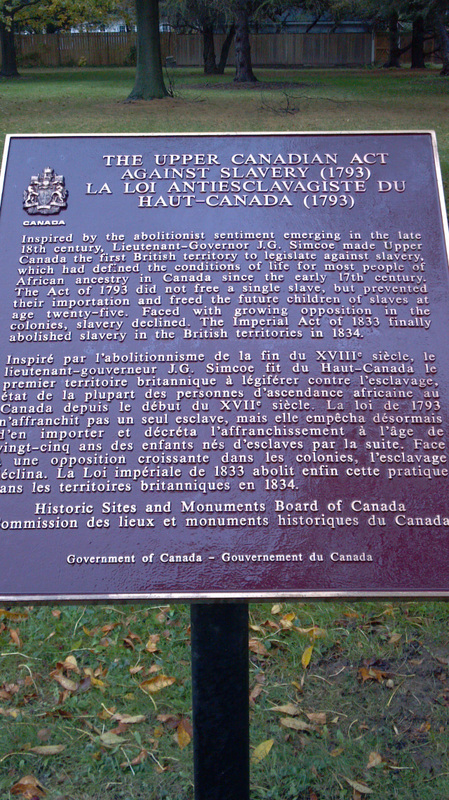 Oh, my, how did those Slaves follow the stars to Canada? 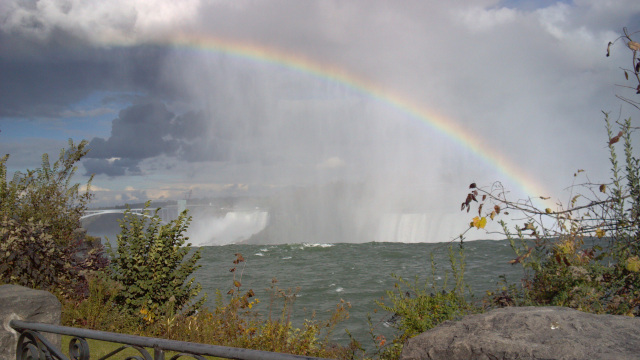 A Beautiful Rainbow Welcomes Us to Niagara Falls! 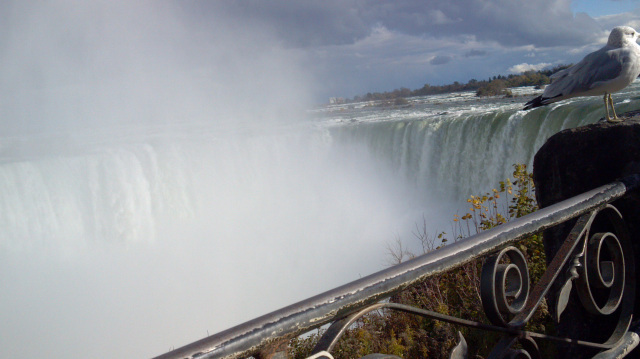 Niagra falls with a gull. 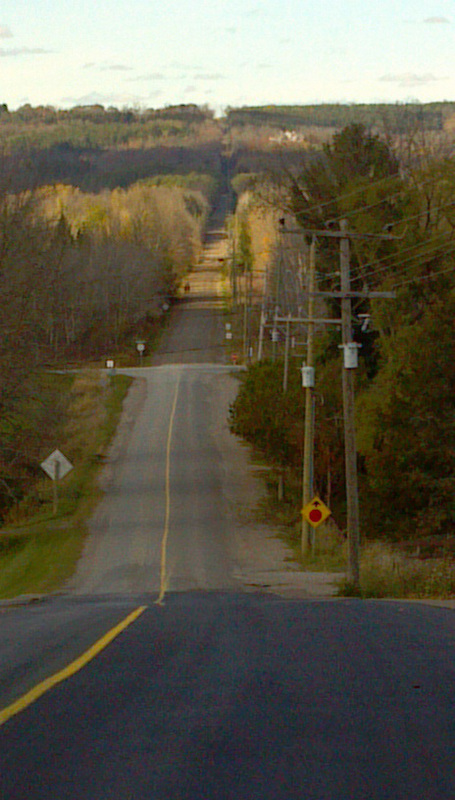 Many of the back roads in Canada, of which the below photo is an example, lacked shoulders and in many cases lacked upkeep - not any different from those in the U.S. Rough riding! 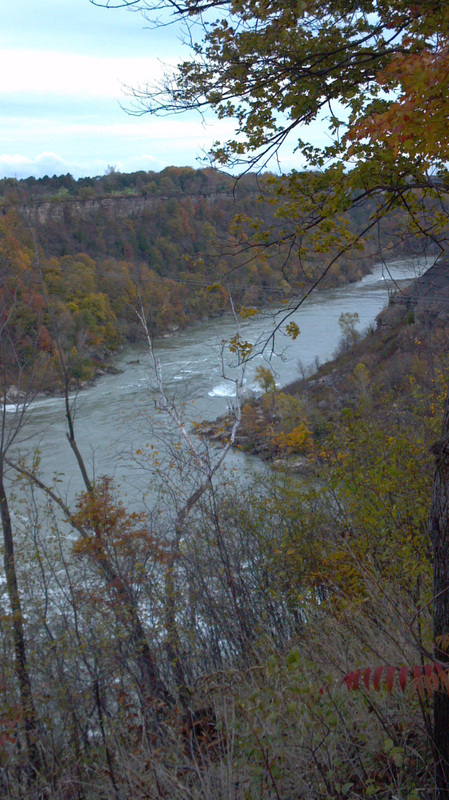 This photo also depicts the hills we encountered once we were 100 miles north of Niagara Falls. Note that we needed to bike this road all the way to the top where you see the opening in the trees. 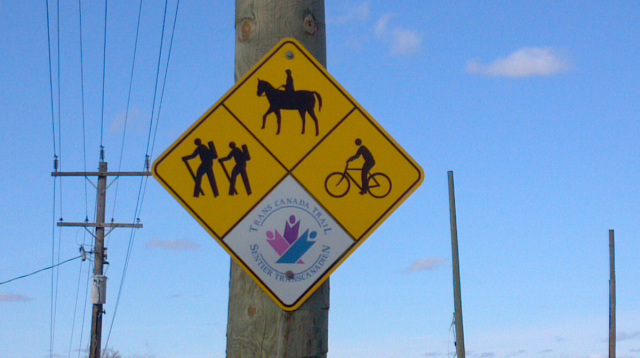 Sign Along a Canadian Road Advising Motorists to Take Care! Other such signs included advising avoiding hitting turtles, rabbits, ducks, and of course, deer. A Beautiful Day for Riding! Traveling from Milton, Ontario, to Orangeville, Ontario. On our way to Waterdown, Ontario. In some places there were downright piles of the stuff! 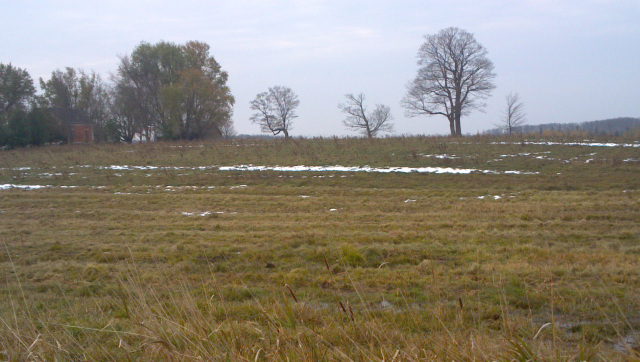 Temps were in the 30s in such places ….Brrrr. Our riding kept us warm, however! What a wonderful trip! We are so lucky to be able to do such a thing. 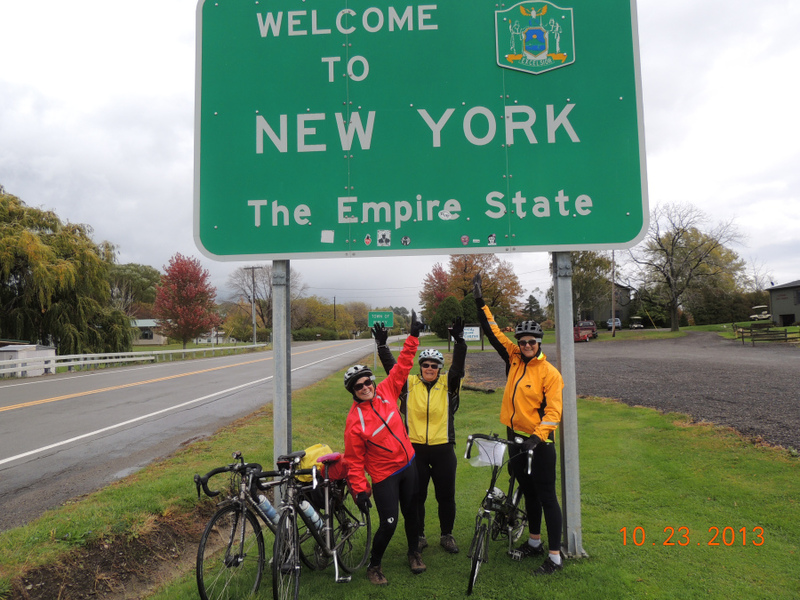 Yesterday, we drove back from Owen Sound to Syracuse, N.Y. We slept in this morning, ate our usual banana, did the laundry, but, we did not get on our bikes today. Thank you for traveling with us! Seven weeks away from home. At the onset it seemed like an eternity, yet the amazing history we learned, the adventures we experienced, the things we saw, the people we met and the fun we had, made the time go rather quickly. 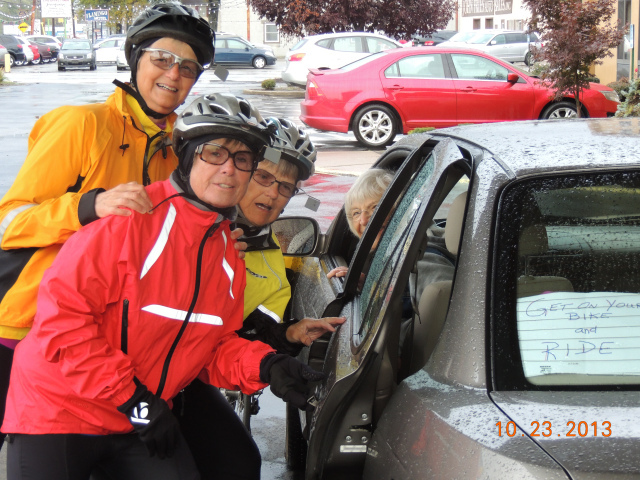 We have opined about what we would change if we were to start all over, and mostly agreed that had we begun a week earlier, we would have missed the cold, wet weather that met us in Canada, and thwarted the cycling for a couple of days. I was asked about the biggest surprise in my journey, and with very little hesitation I replied that it was the fact that they got on those bikes day after day after day, regardless of the circumstances. I think I can safely say we have no regrets and only a few unmet expectations. The latter stemmed from our inability to access many of the places that were listed in the Underground Railroad reference materials. We found a few defunct, probably for lack of funding, others closed for the season, some were not open on the days we visited, and a couple we were unable to locate. Certainly disappointing, but not enough to spoil the trip or the spirit in which it was undertaken.